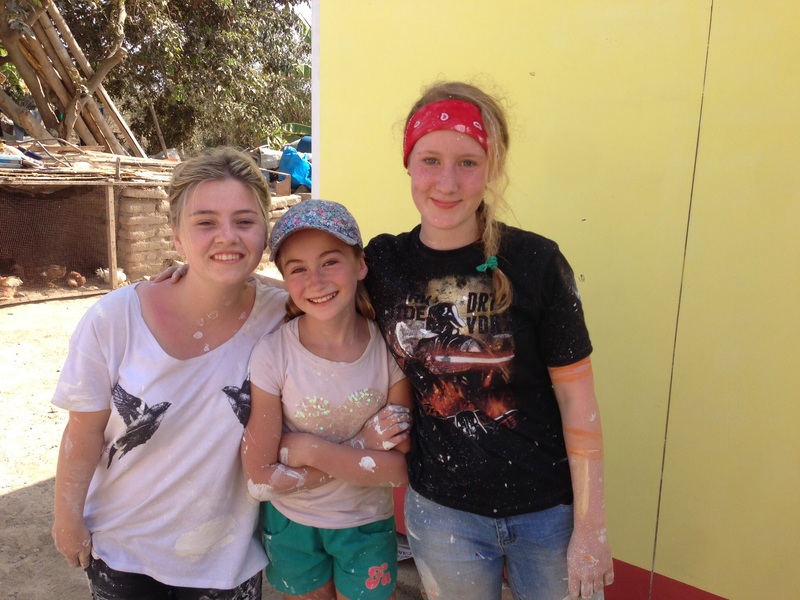 We went to Chincha with a school and helped them with a project where they build houses for people. This is because in 2007 there was an earthquake there. 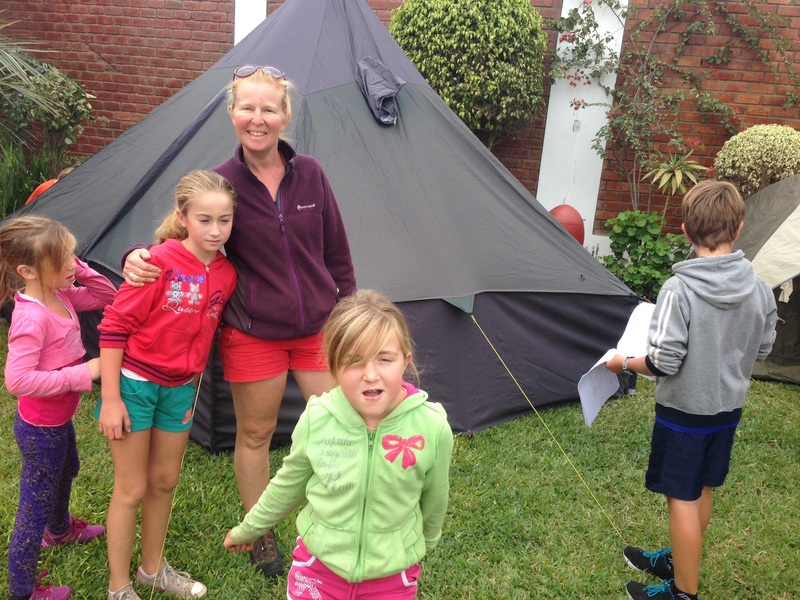 When we arrived we set up our tent which was like a circus tent. The tents were in the mayors back yard and nearly all the grass space was used because there was more than 100 people staying there. After everyone set up our tents we went to our building sites. We were group 2 and Yasi and Toby were in Group 1. We had a house with two bedrooms and one living room to build. 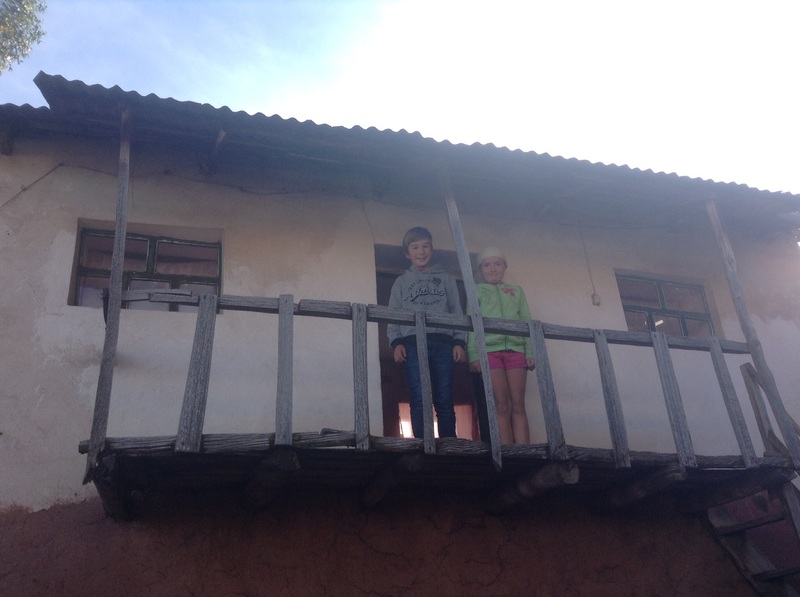 We built a house for Maria the mum and her two children Lesly and Jhordy. Before that they lived in a house made from bamboo screens with lots of other people. Lesly and Jhordy were really excited to have their own room. My favourite thing about the building was painting. 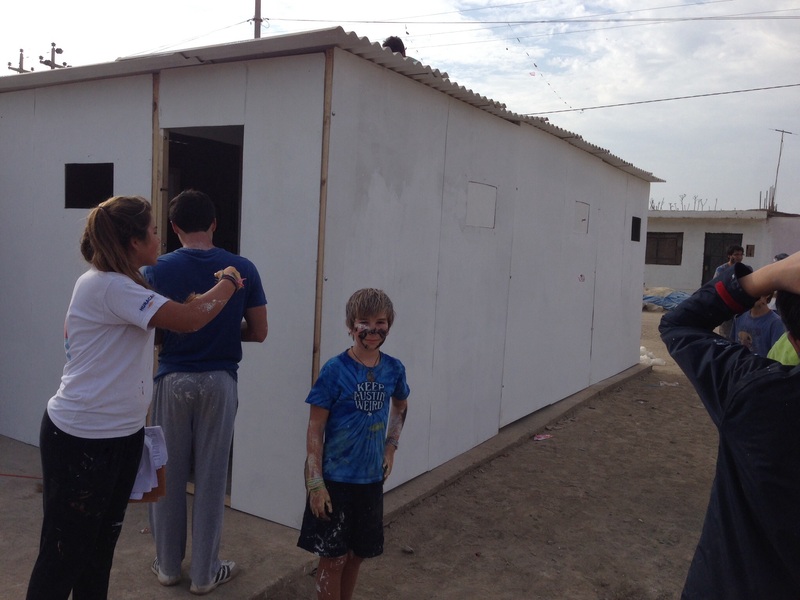 We had so much to paint like the outside walls and the roof. We put the house Up and the roof On the second day. The first day we painted and got all the boards ready. For breakfast the second day we had eggs rolls, meat, cheese and other stuff like that. It was all cooked by the mayors wife called Orietta. It was delcious. The next day we put the house together and painted the inside panels. I really liked painting love hearts in Lesly’s room. Once it was all put up the boys were joking that some brown cement like putty was real chocolate and one of them tried to trick me but it didn’t work. I knew what it was but I didn’t know they used it as putty to cover some holes. Emilio helped them to trick me but they never did. I played with Hannah, Andrea and some girls from the other group. The place were we built was dry and there was lots of dust and it looked liek there was an earthquake. I not only leant how to build a house but also made lots of new friends. I did so much work helping to build a house. I did lots of painting. I played with Hannah a lot. She is an exchange student from Canada. Shane is my new friend and we played games together and I cuddled him a lot. When we were waiting we caught some of the kittens and played with them. They were medium kitten size. I held the cats a lot. I made love hearts on the wall in lesly’s new room that we built. It looked very good. I was so tired the first night and I fell asleep at dinner before I even ate. My baba held me and took me back to the tent to sleep. It was a fun weekend. 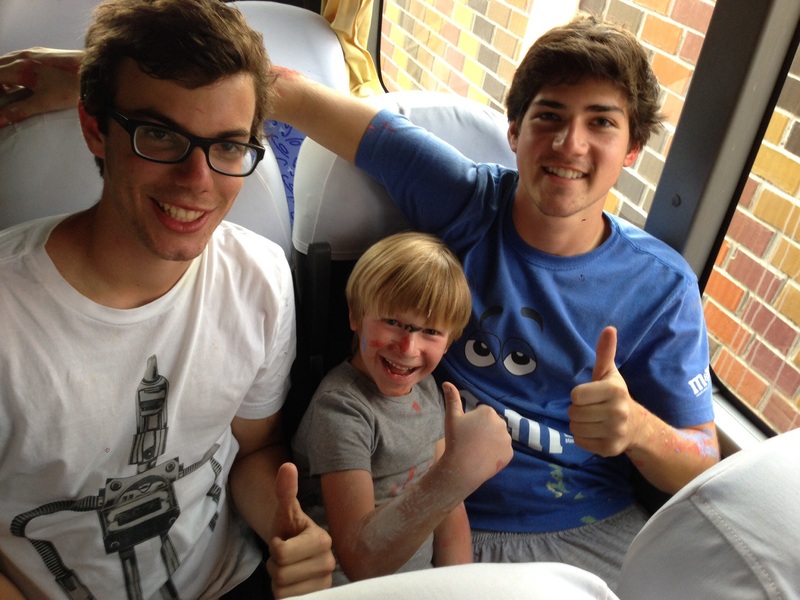 This weekend we stayed with some friend from Australia called Harry and his son Luka. 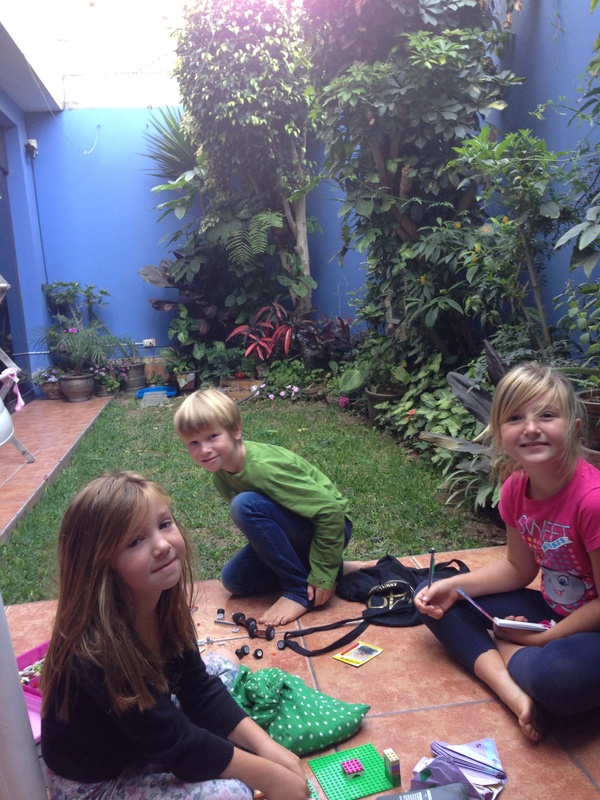 We stayed at Harry’s house on Friday night in Lima. 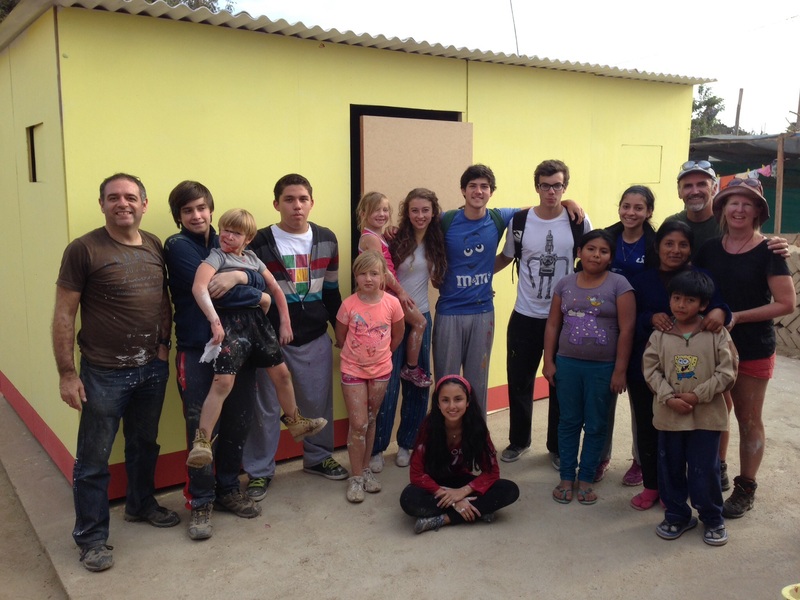 On Saturday Harry took us to a house building project that he organises at his school. 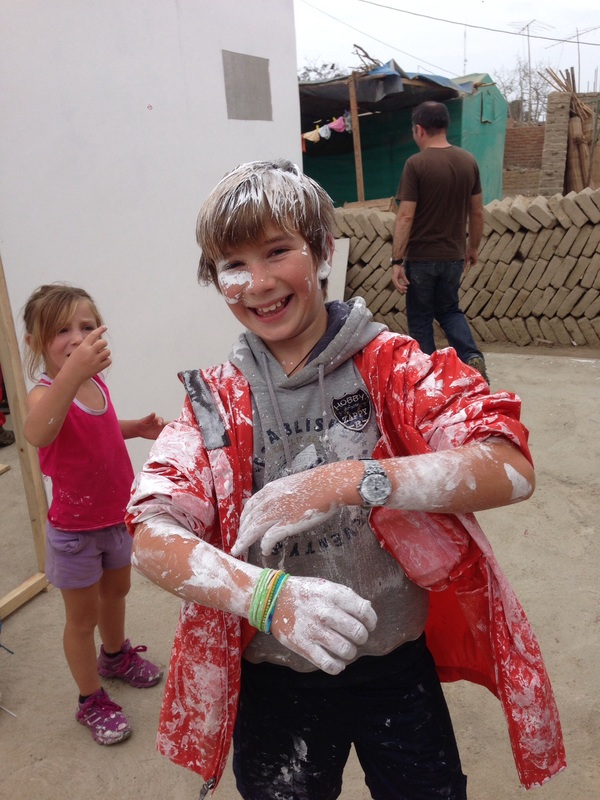 Harry works at a British school in Peru and the house building project was like a school camp but Harry took us along with him. Harry put me and Toby in a group together and put my mum, baba, Zoi, Emilio and Kalika in another group all together. I did lots of painting and hammering but I only did some hammering until I hammered my hand so I went back to painting. When there was no more panting to be done, there were some kids from the village that we were building the house for and they wanted me to play with them but they spoke to me in Spanish. I don’t know Spanish so I told them but they didn’t listen to me and it got a bit annoying but I played anyway. I made some wonderful friends Maddie from Australia and Hannah and Jacquie who were on exchange from Canada and another Peruvian girl called Andrea. The second day we did colourful painting on the walls. By the last half an hour we hadn’t got our roof on yet and it was getting late but eventually we got it done. We were running a bit late cause our house was bigger than the others and there was no power for the whole day In Chincha so we had to wait for the generator that came to our group last. It was really exciting to see the house up cause I looked at it and though ‘we built that house’. 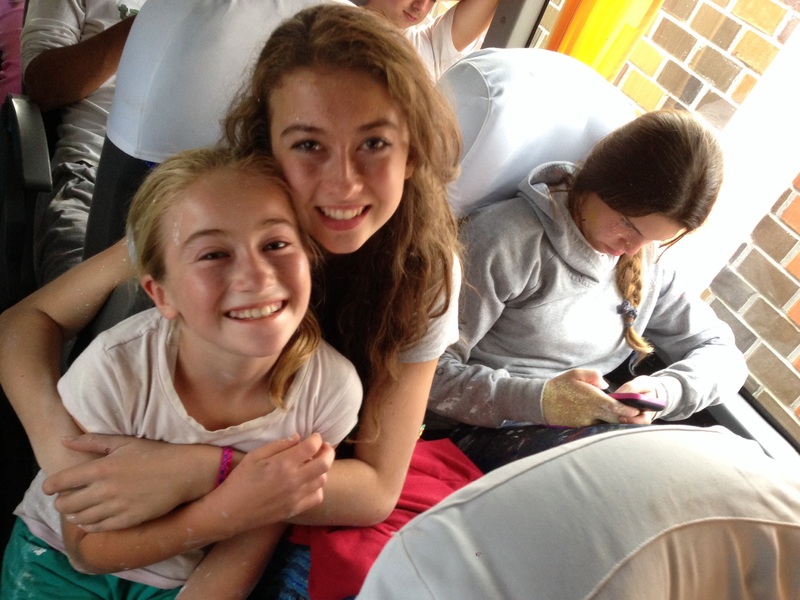 On the way back to Lima it took 2.5 hours and I sat next to Hannah who is 15 Yrs old and on exchange from Canada. It was so nice to talk to her. If I ever go on exchange I would like to go to a French or Spanish speaking country. 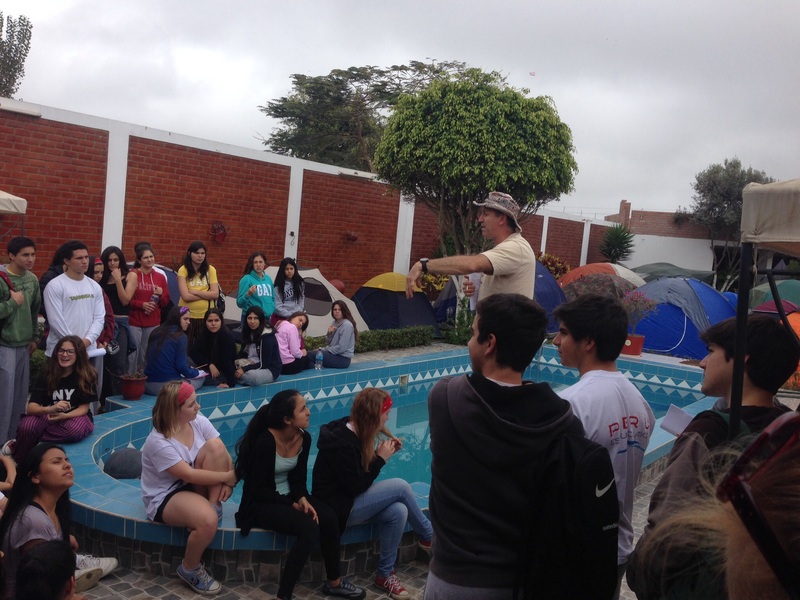 On the weekend I met lots of new friends from Markham College in Lima – their names are Jeronimo, Mauricio, Harry and Jose Miguel, and other teachers called Liam and Shane. I played with Shane the most – he is a music teacher and was fun. He said that it was the first time he’s ever banged in a nail. It was, cause he told me and he didn’t have a smile when he told me. We built a house for Maria who is the mum and her kids Lesly and Jhordy. Their house that they lived in had Lots of other people and was made of some sticks and some bamboo for a roof and walls. I really liked the leaders of our group. One guy was funny when the ice cream van came I yelled out ‘ice cream’ and he said ‘Ice cream? I can’t work without ice cream’ and he ran there. I also went to the ice cream van but it wasn’t a real ice cream van it was just a bike with a box full of ice cream. I got the sandwich ice-cream. When we built the house I really liked hammering and also painting. I got paint on my face, hair and top and my shorts and shoes. I found some paint on the ground and I picked it up and made myself a little stripe on my nose and cheeks and neck. It was a lot of fun. There was a little girl that lived there and she would come up and was a bit excited and rough sometimes. After dinner on the first day we went to the centre of the town and went to see Spider-Man but it wasn’t actually him it was just blown up. He was on top of a ride that was like a roller coaster but it was even more funner and we bounced all the way down and I landed straight and rolled and did a pose. Then we went back to our tent and watched some fireworks. On the way back home I sat with my new friends Jeronimo and Mauricio. Love from Emilio – goodbye. 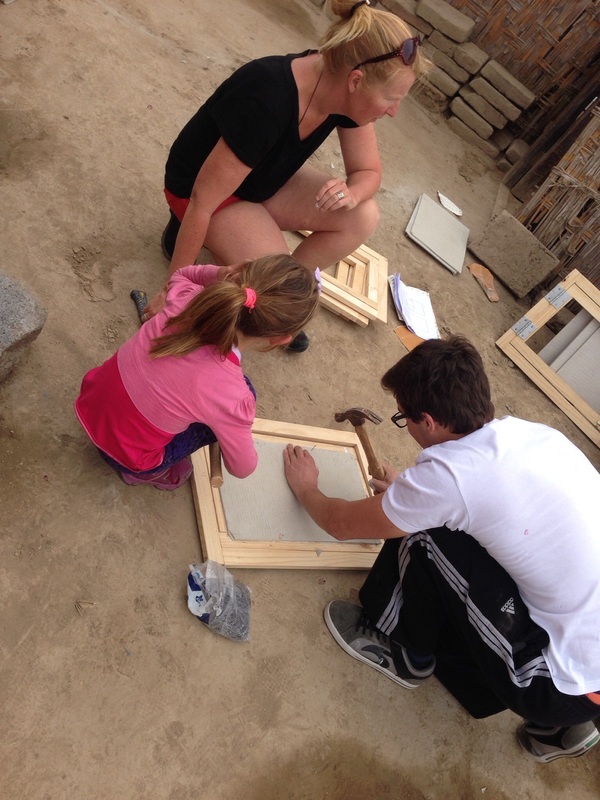 This weekend we built some houses for the people who lost their houses in an earthquake in 2007. We went with Harry Hildebrand (his mum is a friend of my grandma and they went to school together – Harry’s mum is now our next door neighbour). These houses were quite small. There was about 6 houses built from scratch but the wood and everything else was already there. About 90 kids went on the trip & the kids were all aged between 12-17 yrs old. I know the sizes of two houses (the one my group built and the one my mum and baba’s group built). 5m x 5m was the size group 2 built & the size of the ours was 7.5m x 3.75m. In a year or two we are planning on building a dam at our place. Us kids want to build a sort of clubhouse and have a outdoors sports, water sports and fishing club. It may be built around when the dam is built or in could be built in the early months of next year, so this building trip has given us some ideas on how to build the ‘Clubhouse’. Also we have to build a stable in the first 2-4 months because we’re getting 2 retired ‘Riding for disabled’ horses from the ‘Riding for disabled’ school my aunty Carolyn volunteers for. So this building trip has also given us ideas for the stable too! We’ve also thought as time goes by we’ll want to extend the Clubhouse & maybe we’ll Get more horses that might come to us! So we’ll have to work on the extending, won’t we. I think that this house building project is a great way to meet new people & learn a bit about their culture. I wish there was this type of thing around where I live because I could say that about half of Cheshunt, Whitfield, Rose valley and the King valley likes to build – so when you add all that up (kids & adults) you’ve got about 300-500 people!!! This is the order of how we built the house. I always thought if I was going to build something by myself I would get it wrong but I don’t think that anymore. I feel better about building. This building weekend was definitely the highlight of our Peruvian trip (or maybe equal first with the Amazon and Macchupichu). It was so well organised by Harry and his team of helpers. He works at a great school and the students were really amazing. 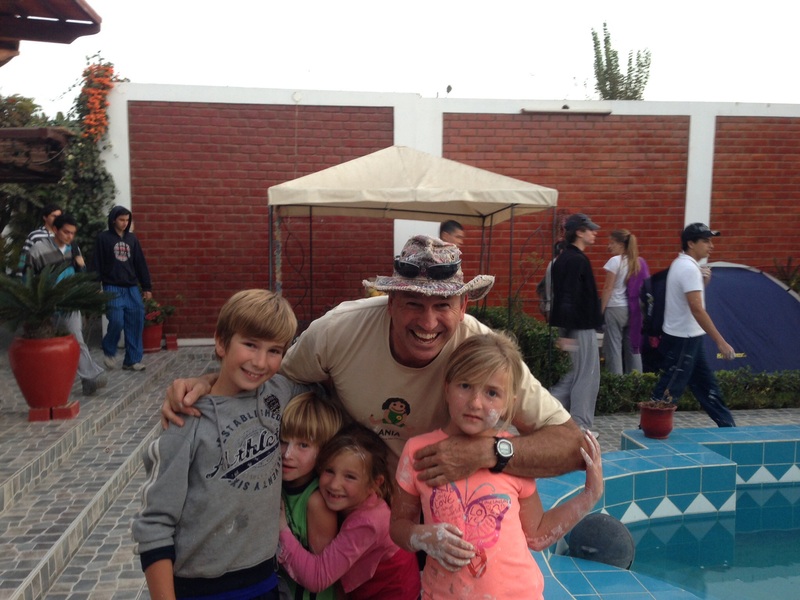 I have such upmost respect for our leaders in my group – Jeronimo, Mauricio and Paloma. They were inclusive, friendly, respectful and excellent leaders. Thanks so much to all the group. Everyone in our group bonded well and I originally thought I’d be on the sidelines with Zoi and Emilio but no – we were all involved. it was awesome also meeting another teacher – Shane who like myself seemed out of our comfort zone to begin with, but by the end we were a great team at installing the windows. I loved the experience myself but I really enjoyed seeing our kids in this situation. 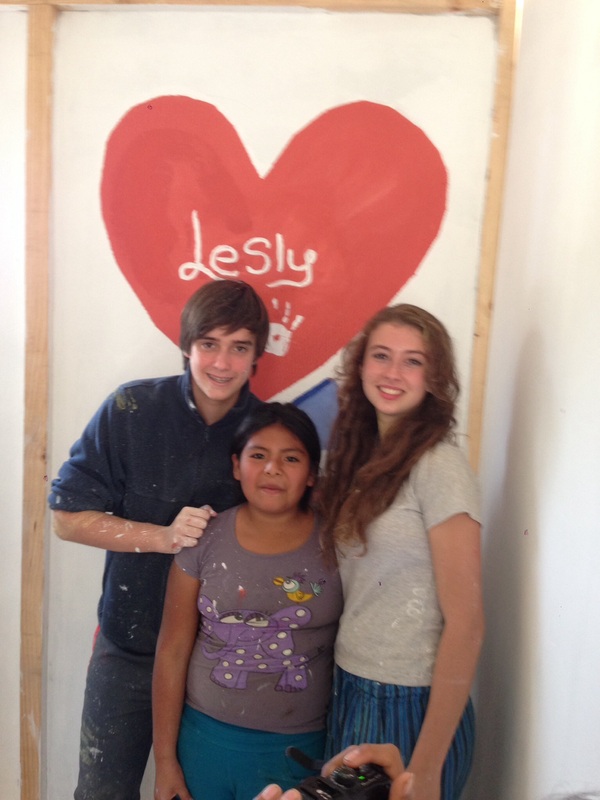 In awe of their own skills, their own abilities and looking up to these amazing Peruvian students. The best moment was at the end when we took a group photo and got such a wonderful smile and hug from Maria and her kids. It was priceless. 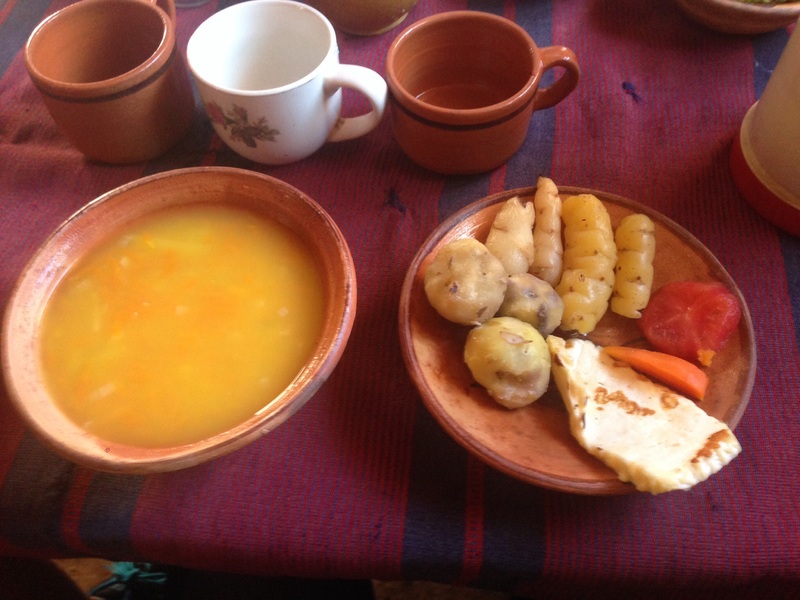 At the moment we are at a wonderful homestay – we just had one of the best vegetarian lunches I’ve ever had – there was Andean soup with vegetables and reeds and quinoa. There were also other root vegetables like potatoes, (harder than what we’re used to), carrot, tomatoes and some kind of vegetable I’ve never heard of – it was delicious and tasted like a mix of Potato and carrot. There was also some grilled goats cheese or alpaca cheese I think. 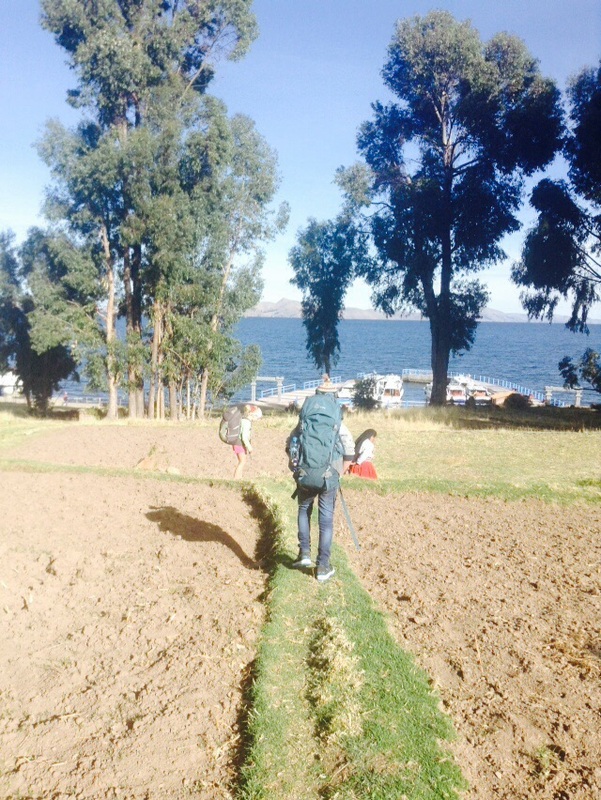 We are on an island in lake Titicaca and its called Isla Amantani. To get to this destination we came from Puno city and got on a motor boat. First we stopped at Uros islands which are floating islands and each island isn’t bigger than about 50metres long. Each island had a president of their own and their own and about 5-7 families living there. The islands are made up of reeds and there’s the first metre which is reed roots which floats incredibly well even when it’s full of water. Then they top it up by cutting down reeds and putting them flat – a layer in one direction then you change directions. The first layer is about 35cm of layered fresh reeds and then put more dried reeds on top till they’ve put on so many reeds that it’s about 1 metre high. To make a real floating island like that it takes about a year to build it. They last about 20 years and then they need to build a new one. 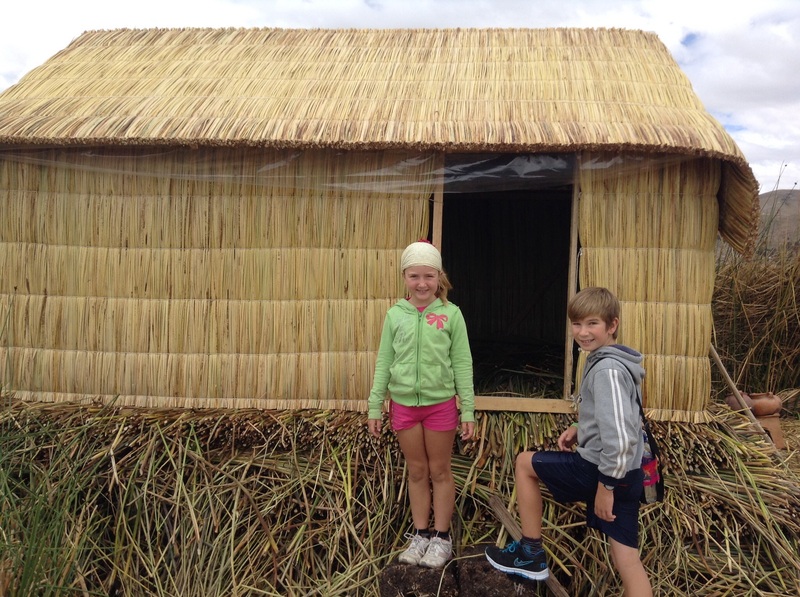 The houses have to be about 30-50cm higher of reeds so that the dampness of the outside reeds doesn’t make them wet when it rains. On the second day we got woken up at 6.30am for breakfast which some kind of pancake biscuit sort of thing. Then we met our guide at the port and sailed for an hour until we got to another island called Taquile Island. We had another hike and our guide taught us about Taquile culture and we stopped a lot to look at plants that cure stomach aches and many other things. He even showed us a plant that he and hIs dad harvested a lot once and made a big bonfire. The next day they collected the ash and used it for gunpowder to make fireworks. At the square of the town we met a guy from Peterborough in Canada and he knew some Servas people that we knew. 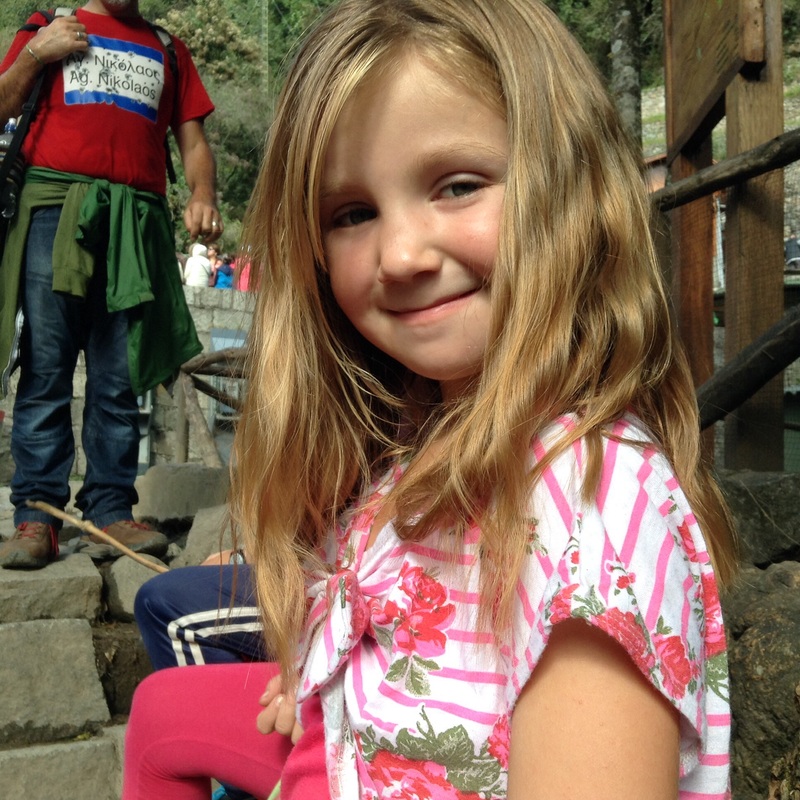 Isn’t if funny that we met someone in Peru who knew someone we knew inc and ad – what a small world. Lunch we went to a small outdoor Restraunt and had soup and omelette and there was grilled fish and all sorts of things. The guy who owned the Restraunt showed us how to make detergent or shampoo out of a plant so that its natural. He took some dirty sheep wool and washed it in the detergent. Once he took it our it was as white as snow. We met a lady called Chris From Florida and we talked to her a lot. We told her a lot of jokes and talked to her about some of the funny things that we’ve done. She was awesome to talk to. I hope we see her again one day. 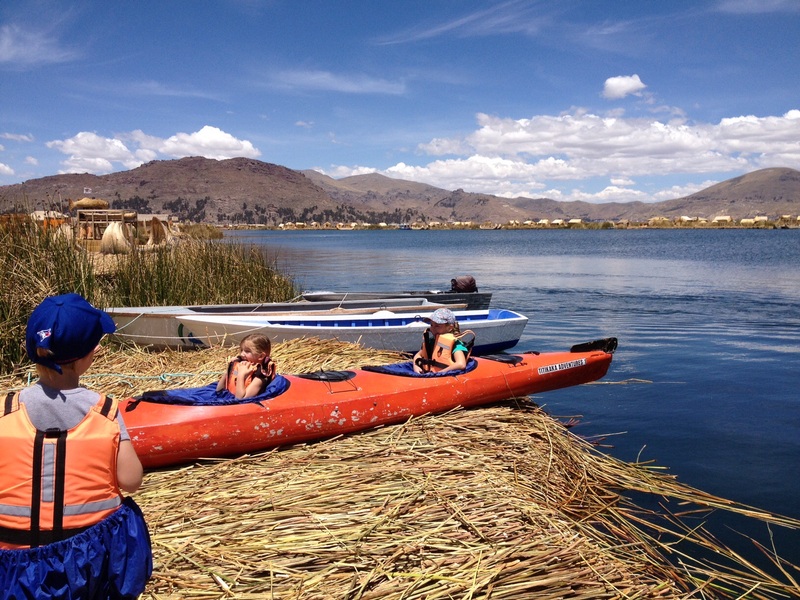 We went to a lake named Titicaca by boat and we went to a floating island. The people of the island showed us how to make a floating island. First there’s big chunks of reed roots then you put layers and layers of reeds – pointing in one direction then the other direction and so on. Then you add more on top where the houses are going to go because the houses are aLways higher so they don’t get wet. It took five minutes to build a doll size island but to build a real island it takes about a year and lasts 20years. Then they add the houses which are only one room which all they have is clothing and a bed. In the middle of the floating island there was a hole with a net in the water and they caught fish to eat. It was very noisy walking on the island because all of the dried reeds made a loud sound. Apparently they eat the reeds and put some on their heads if they have a headache. After the small island we went to another island where there was also shops. We got there in a boat that was made out of reeds. It was like two canoes stuck together with a platform on top. Our next stop was the island Amantani that we were going to stay at. The name of our host lady is Ilda. That evening we walked up to 4140m above sea level to see the sunset. It was amazing. In all the photos we took it looked like the clouds were on fire. The walk was a tiny bit hard because at high altitudes it’s harder to breathe than it is at sea level and down lower. When we got back home we had dinner then we went to a party at 8pm. We only stayed for 2 or 3 dances cause we were tired and we had to get up early at 6.30am to have breakfast and get back on the boat. In the morning we had these pancake things which were hard and sugary and also the Titicacan mint tea which we had at every meal. It was fun staying with the local people and seeing how they lived cause it was just so different to what I’m used to. 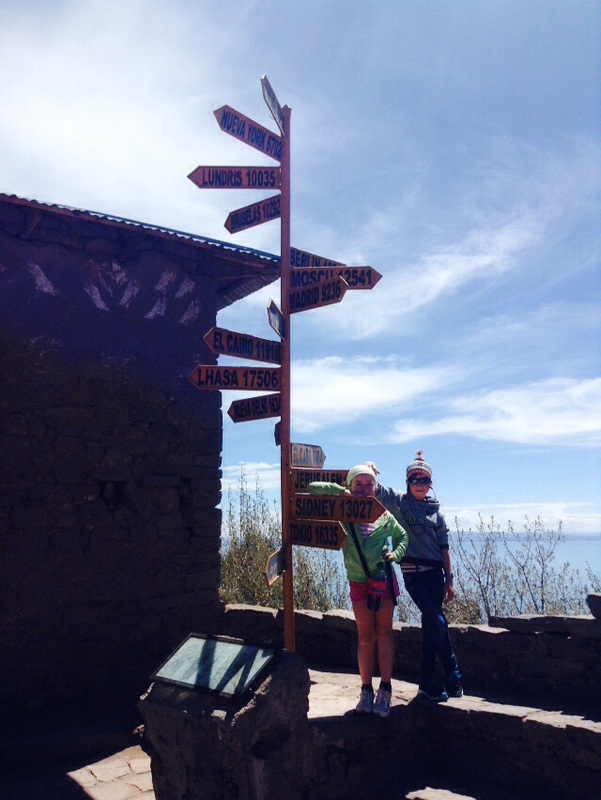 Ilda grew up on the island and she has only ever gone to Puno but has never travelled anywhere else. 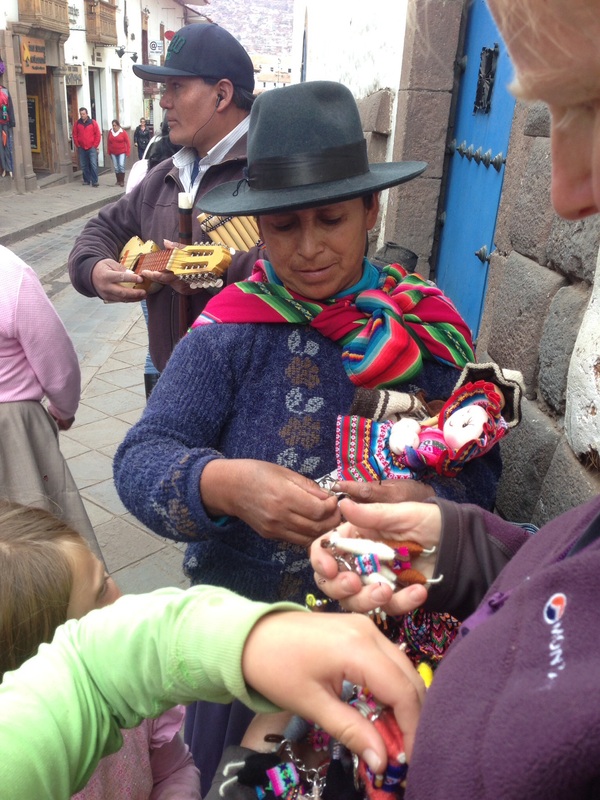 Her two sons go to school in Puno. We got back onto our boat and went to a different island called Taquile Island. We did a walk up a small hill and when we stopped at an archway where the road went flat or downhill until we stopped at the square where we had a rest. We got some mango at the square and it was delicious. Lunch was really delicious – I had fresh grilled trout with rice, veggies and chips and some lime on top. Then we walked down to our boat and we were talking to with a friend that we made called Chris. It was really fun because I got to talk to her the whole way down about all kinds of stuff. 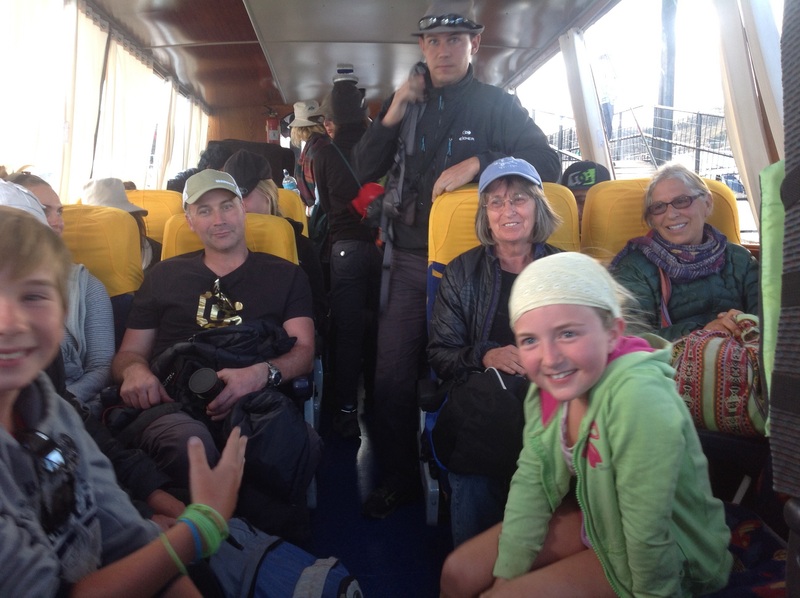 The boat road back to Puno was 3 hours and we didn’t sleep – we talked to Chris and some other Australians who came from Sydney – the whole way back. So off we went. Flat lake, little breeze, Yasi and Emilio in one kayak (When Emilio put his skirt (water protective layer that connects to the kayak) he danced around claiming this was the first time he had worn a tutu!) Zoi and I in the other. We paddled the lanes made by reeds, saw ducks and birds and enjoyed the relative quiet of the lake. After a while Yasi and Emilio hitched a ride with our support dude, and we made it to the floating islands of Uros. It was fascinating to say the least. I went kayaking with my mum Sandy and it was so much fun. We went to a little Island and we had some food and me and Yasi was struggling getting out on to the island. We paddled hard and the guys pulled us along for a little bit and we went back to the island and had lunch then my baba and Kalika and Toby came home from their trip. It was so exciting to see them. My favourite thing about the island was when I picked reeds and started weaving a little nest with dried reeds. When we got to the island we went to a little cafe and got some Picorini, which are like donuts with fruit and honey. Then we didn’t kayak back – we took the boat and also on the way to the floating island we were getting tired and the man helped to pull us along cause it was a long way. Then we took a fast boat back. The island had reeds that were floating and they had more than two thousand reeds on the island. We forgot to get an ice cream on the way back so I played LEGO and excitingly the others came back. Machu Picchu was simply incredible. I always knew it was going to be a place I loved but I wasn’t prepared for how overwhelmingly beautiful and awe inspiring it would be. 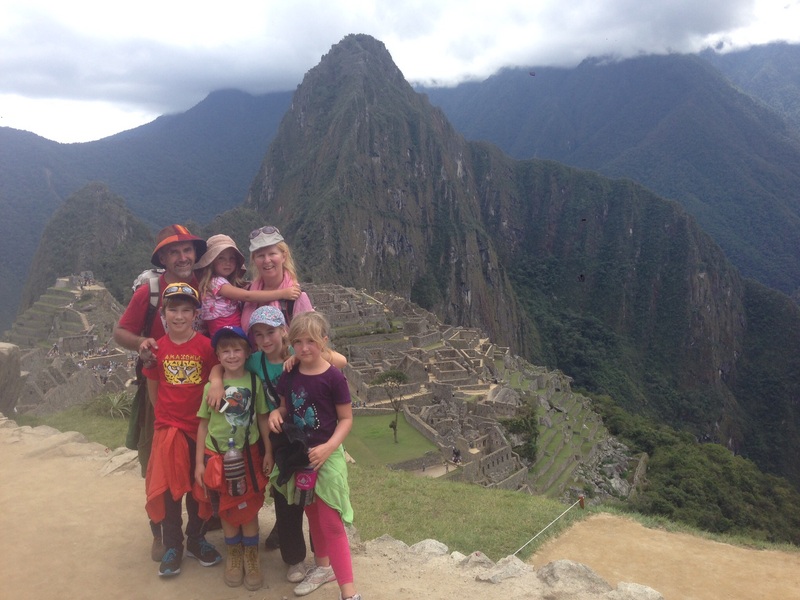 I would have loved to do the Incan trail though wasn’t sure how the kids would go hiking 100km in five days in over 3000m altitude. Also it is something you need to have planned a long time in advance as they only allow 500 people per day on the trail. As we are the type to plan our travel a few days or a few weeks in advance at best, it wasn’t something that we could do this time. 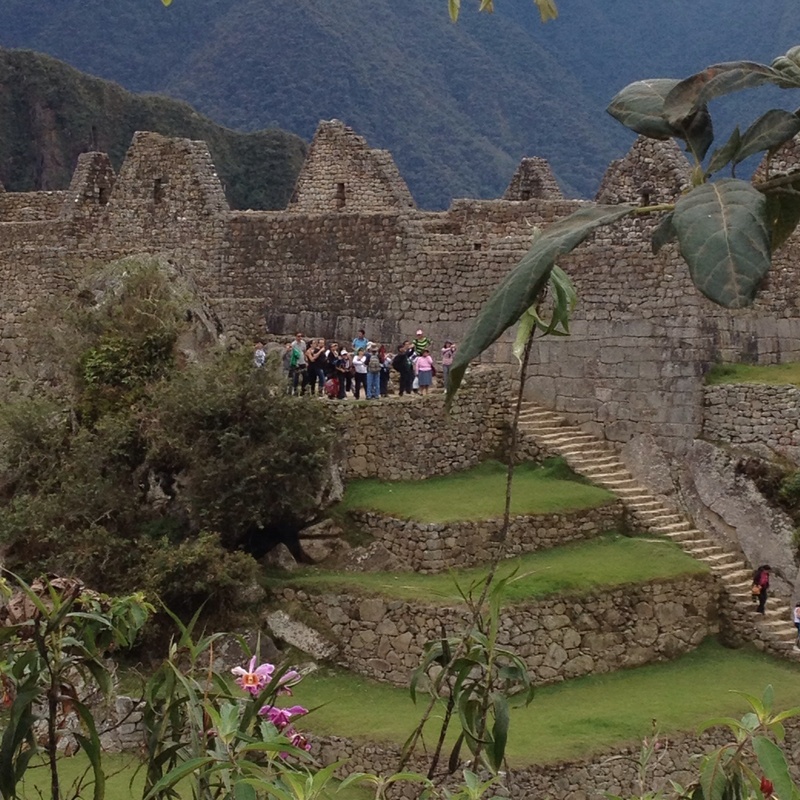 Therefore, we woke up at 5am and made the four kilometre trek up the mountain from Agues Calientes to Machu Piccchu. I felt like we at least needed a little bit of effort and sweat to see this magical place rather than pay $10 each to get a 15 minute long bus! It was the best way to get there. We were at the top about 7am and the light was amazing. I stood in line wishing they didn’t let 2500 people in per day and that it was only us but seriously after you first glimpse the famous view it’s like no one else exists and you’re just there. It’s such a beautiful feeling……. 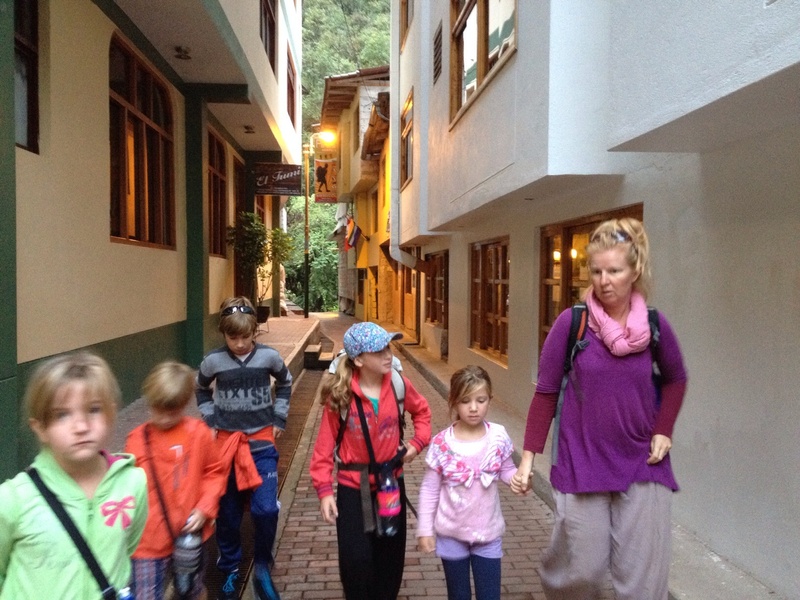 The walk up to Machu Picchu was tiring but when we got there it was amazing because it was so ancient and beautiful. The look of it made me think it was spiritual. I found it quite amazing how the archeologists could find out so much stuff like where the observatory and the planetarium was. It was so amazing that their were llamas there and I was wondering if they were farmed or wild. Somehow my legs were shaking when we got back to the town. I didn’t make them shake – they shook on their own from being tired. I was exhausted but glad that I had done it. I was the first one on the track up to Macchu Picchu and I counted how many steps there were going up – there were 1925 which is just to the gate – much more when you got in. I think it might have been more than three thousand by the time we walked all around Machu Picchu. I thought it was actually quite amazing how it has been there for hundreds of years. We saw a double decker house which I didn’t think they would have but it was pretty cool. When we first got to the steps I counted up to 1 step and I was already tired. I listened to my sister Kalika cause she counted all the way up and there was nearly 2000 steps. When we got there I was tired but when I saw the view I almost fainted cause it was so cool. I liked how the grass was so furry and it actually looked like a village. We walked around and took pictures and told stories. I drew a dinosaur and a village with a dragon in it while I was sitting on a rock. People smiled at us cause we were writing and drawing pictures. After we did that we went to a house and it was quite cool without a roof. We saw a double decker house and the second floor was made out of sticks. It was cool and when we went down we weren’t as tired cause we were running and it felt like we were doing tap dancing. Then when we got back to the road we went to a park on the way back home. 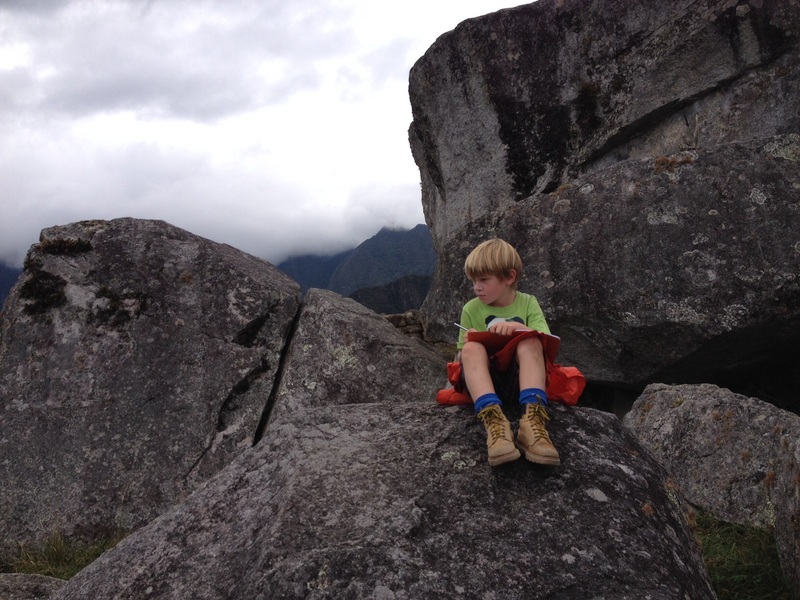 I liked Macchu Picchu because it was fun because we climbed up the mountain but I was very tired. I walked all the way up. I liked the double decker house most of all. When we got back to the town I loved the pizza we had. I was very hungry. In the afternoon we played lots of LEGO. We caught a train from a place with a long name called Ollantayatambo to the town near Macchu Picchu called Agues Calientes. It was such a nice train with big seats and nice tables and my brothers and sisters and I played LEGO and built forts all the way there. 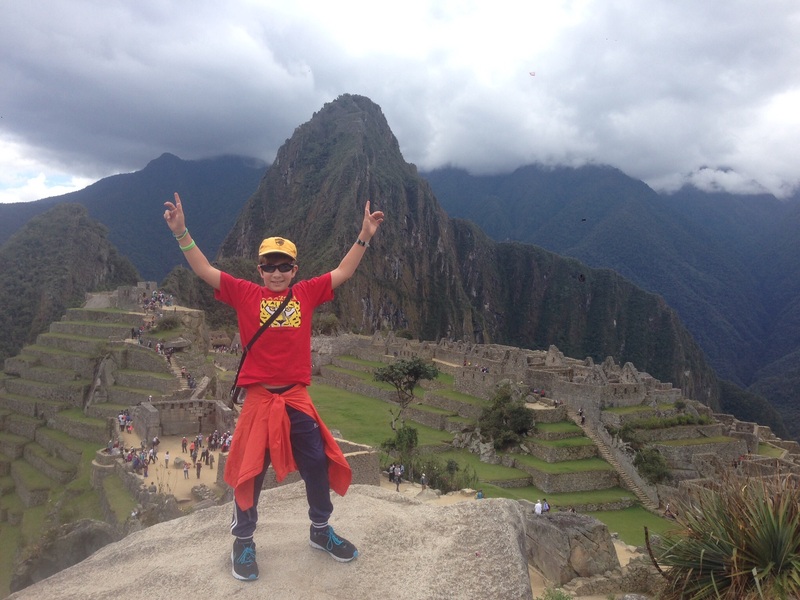 Machu Picchu was a very nice ancient city from the 1500s and the secret city of the Incas. It had been lost for many years and was discovered again in 1911. It wasn’t destroyed by the Spanish because they didn’t find it which was lucky. The view was very beautiful and it is kept very well. Some of the houses had been restored but some had been left and some had the roofs redone. The houses were made out of stone and roofs out of grass. We stayed there for about 5 or 6 hours because there was so much to see. 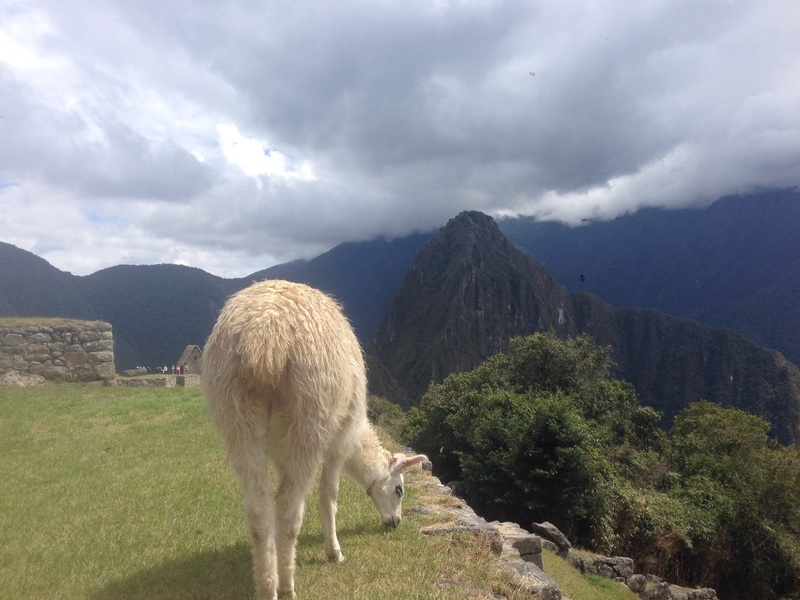 There were llamas at the ancient city – I’ve no idea if they were wild or farmed but they kept the grass down. When we got to a rocky part we sat down and mum and baba asked all of us to write a passage of what we have learnt about ourselves and what we’ve achieved on this trip. This trip I have found out lots more about myself and I think I know how I want to be in the world. I have learnt to work with my brothers and sisters but it is hard some times but I always find a way out of the hard times. I have learnt more about the world. Learning a new language wasn’t so hard. It has helped my reading and writing. I once believed I would never learn Greek but I did. All I needed was just a little bit of faith in me. The Incan culture survives in Argentina, Bolivia, Chile, Colombia, Ecuador and Peru. 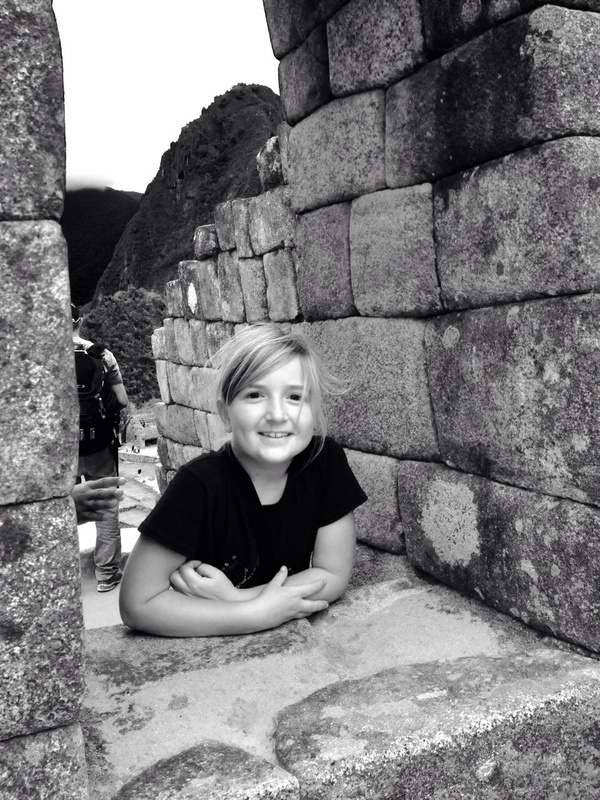 The capital city of the Incan empire was Cusco where we are now. 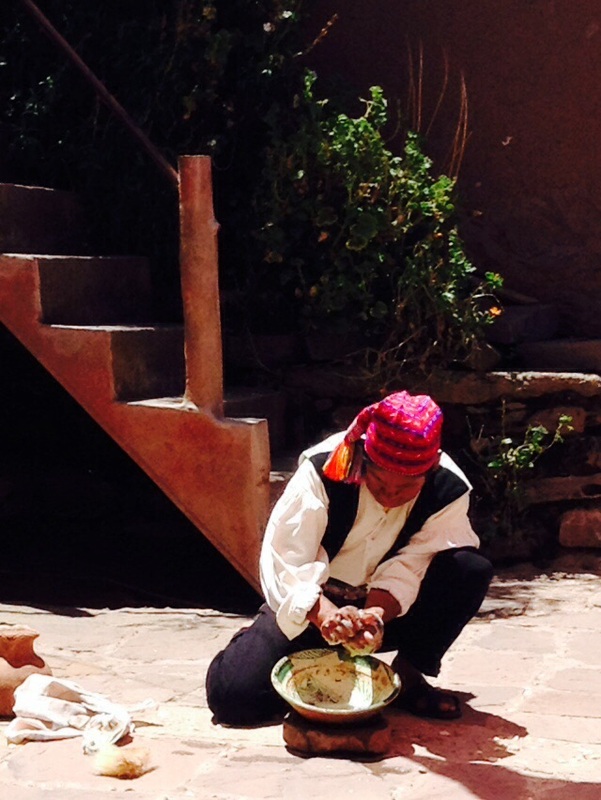 The traditional language is Quechua and it is still spoken by many people today. It’s flag is a rainbow flag. Incan culture is very colourful. A lot of women wear colourful tops with very colourful skirts. 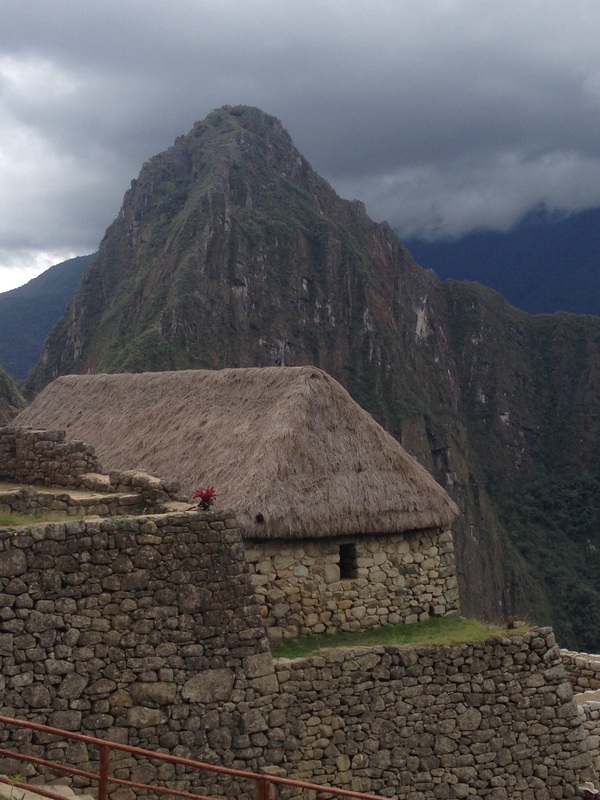 The Incans from Machu Picchu were wiped out by the late 1500s. 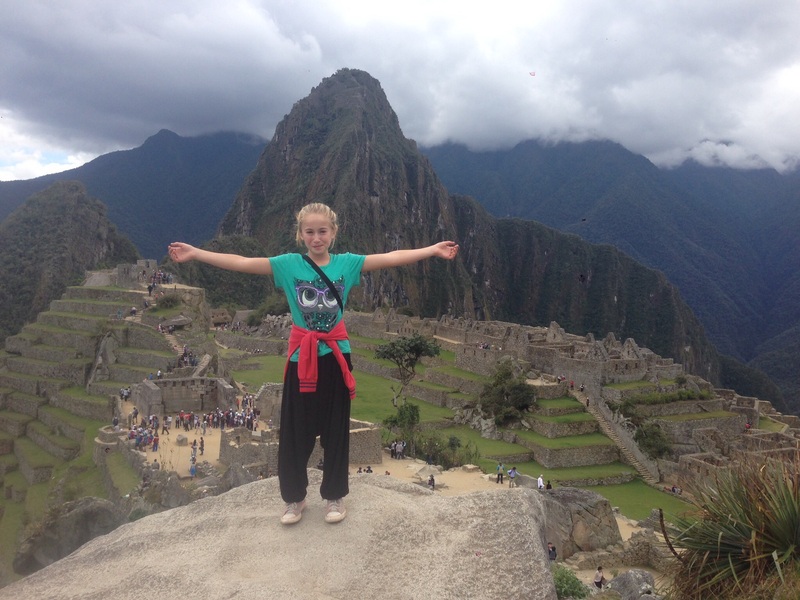 Machu Picchu is one of the most famous and spiritual sites of the Incas. The Incan houses were made of stone bricks that’s why they are still standing, the rooftops are made from sticks and leaves which is why they are destroyed. I think it’s common for the rooftops in those days to be made out of leaves and grasses. 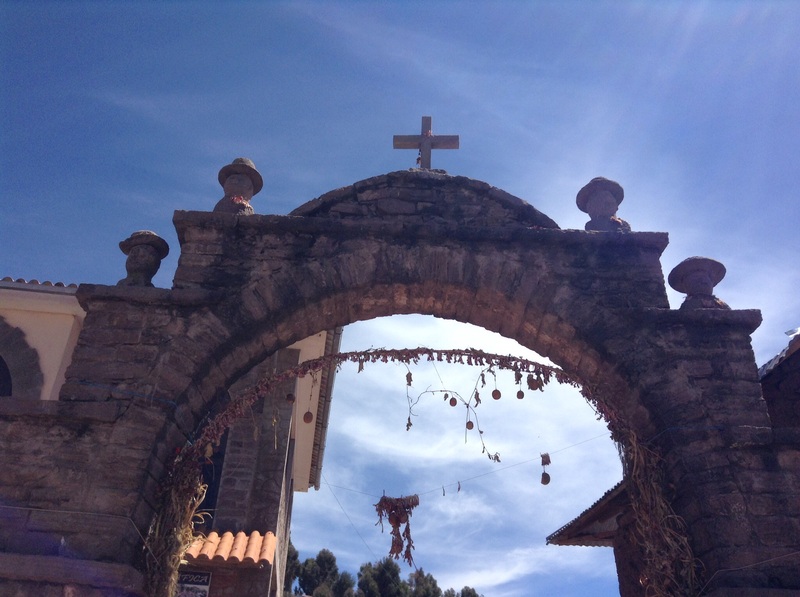 A visit to an organic farm and an alternative school in the Sacred Valley – this visit was set up for us by our friend Harry Hildebrand and is an inspiring school with currently 10 students – what a beautiful setting……. thanks Aima for hosting us and showing us around. Overnight buses are my pet ‘hate’. Sorry to use the ‘h’ word dad, but I cannot find another word to describe the emotions I feel when an overnight bus trip is looming. We have had a pretty good run and Christos knowing this strong distaste of mine has avoided them where possible. We have done two so far on our trip. One was okay, I got some sleep ( Bulgaria to Greece), the other was horrific although it was all over at 2 am (Toronto to Chicago- pre Chev Lightening). Air con broke down in middle of summer, 2 hours longer than expected and an alarmist hyped up bus driver as our introduction to America! Today marks the third. My world is changing. I sit at the moment on an air conditioned bus from Puerto Maldonado nearish to the Peruvian, Bolivian, Brasilia border (having just spent 3 nights in the Amazon, teasing tarantulas out of their holes- a whole other blog) to Cusco, a kick off point for Macchupicchu. 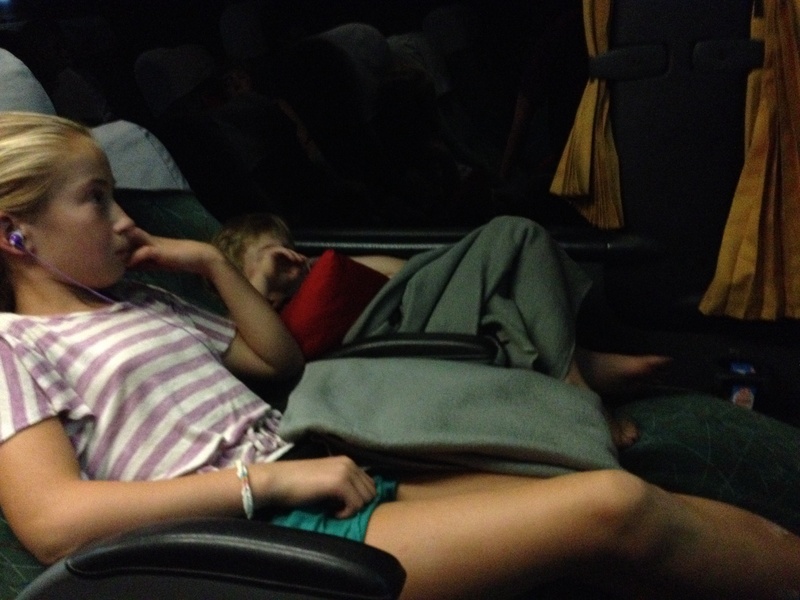 11 hr bus ride ahead, we’ve filled in 9 hrs in town in 30 plus degree heat with high humidity, itching huge amounts of bites aggravated by the unrelenting heat. Tired and so very very hot and cold cold drinks are impossible to find. And I’m so excited I’m not sure I’ll be able to sleep! The bus is a normal size coach- they usually seat 46… This sleeps 35! Recliner chairs. Snacks of biscuits and a juice, blanket and cushion, and then along comes a waiter in black pants and a white shirt with tea or coffee. 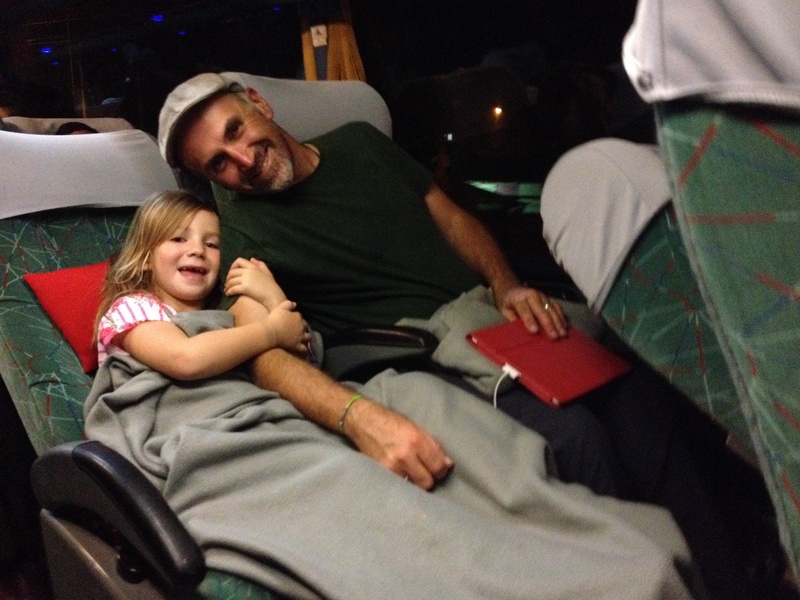 We could have chosen a $60 bus ride that took 5 hours, or flown for about $90, but given finances we chose the $27, 11 hour overnight bus to save money and also take place of needing to pay for accommodation… We scored! My itching is even reducing as my body cools down! Most kids are sleeping. Wifi even works on the bus so Christos is responding to all those work emails, or booking the next stage of our unfolding adventure, and you can charge devices at your seat. It’s unheard of! Only thing to ignore is the ‘oh so loud’ movie they are showing, and the fact that we will wake up above 3000 metres so need to watch out for altitude sickness… Fortunately we are going to overnight below the magical 3000m mark in the sacred valley near Harry and Vanessa Hildebrands plot of land. But for now, I want to recline my seat and rest my eyes in a 80% horizontal position… It’s as good as business class I’m sure! Ps. Mad mosquito bites, full on turning bus almost rolling us out of seats and a serious crack of the dizzy, sick altitude mixed with car sickness I’ve never felt before meant my optimism was not quite fulfilled. However, apart from our light sleeper Yas and I, all the others slept like logs! 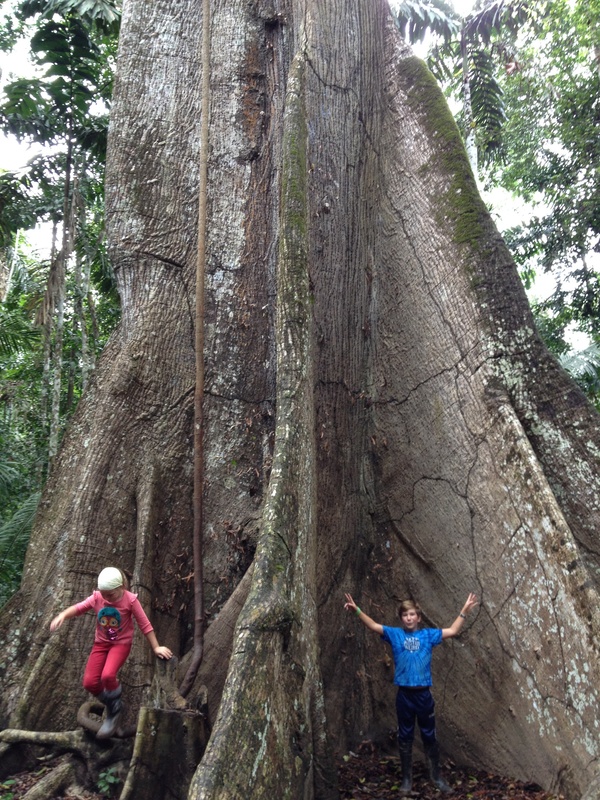 Our excitement was palpable that we got to visit the Amazon jungle during this trip. So appreciative to Harry Hilderbrand who helped us organise the trip through his biology teacher contacts. The whole jungle area is so alive and full of intricate, strange, amazing and superb biodiversity. It’s like nature on steroids! Seeing the Amazon has been a dream forever though also a bit scary for me cause I have watched too many of those nature shows about piranhas etc. Never in my imagination would I actually be swimming in piranha full waters! 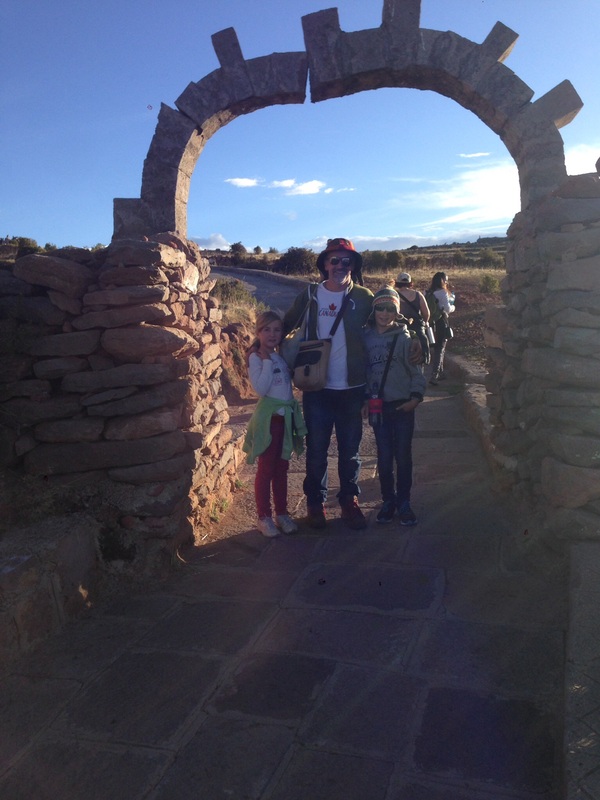 I’ll let the kids describe the experience……. 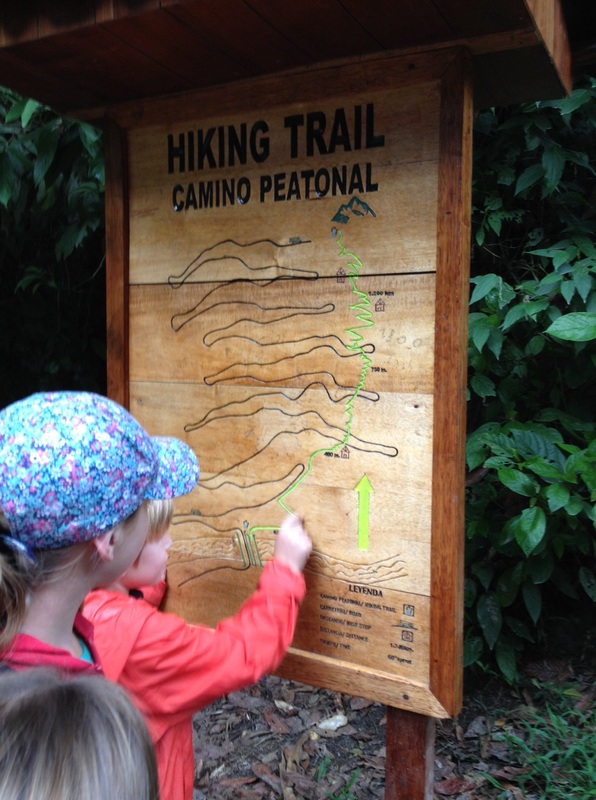 Today we travelled to the Amazon Jungle from Lima to Puerto Maldonado. 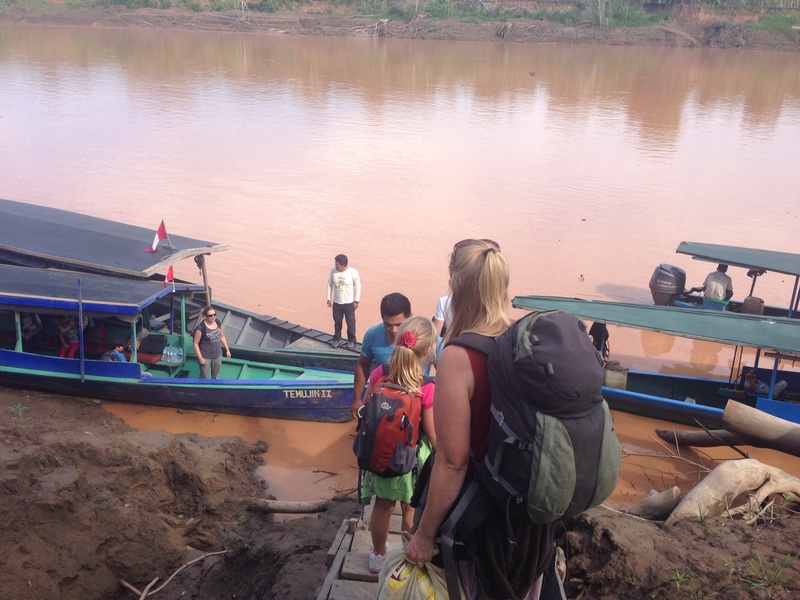 We had to catch a taxi, then 2 planes, a bus then a boat to our lodge. It looked like the plane landed in the middle of nowhere. 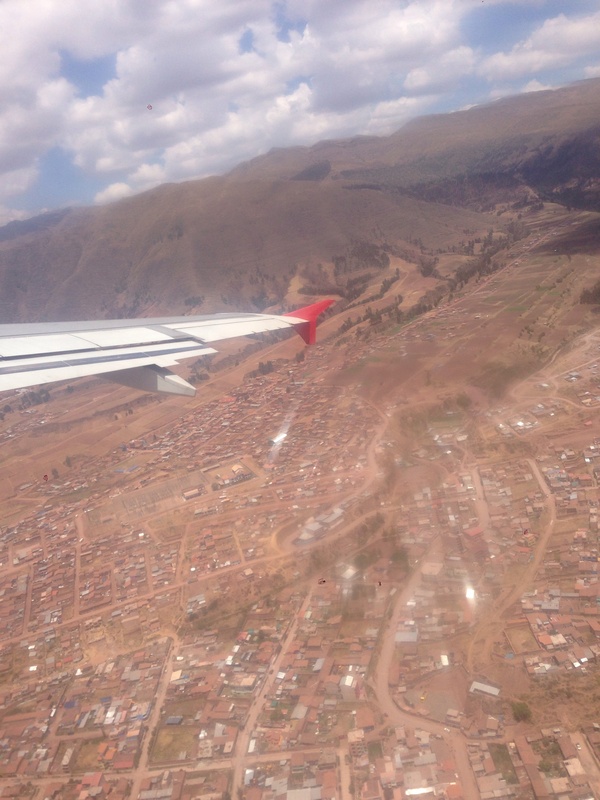 The first landing was in Cusco and it was like in a valley surrounded by mountains that looked like a desert. The second landing was in a small town called Puerto Maldonado and it is close to the jungle. 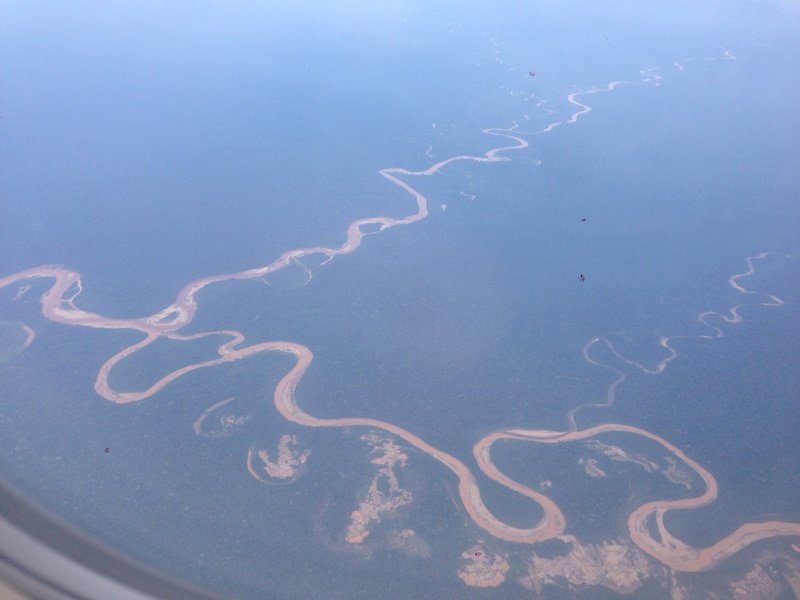 We saw the rivers from high in the sky and it looked like small and completely brown water. It’s actually a really wide river but it looked small from the sky and it was so curvy. Now we are in the lodge and it is almost 8pm which is dinner time. 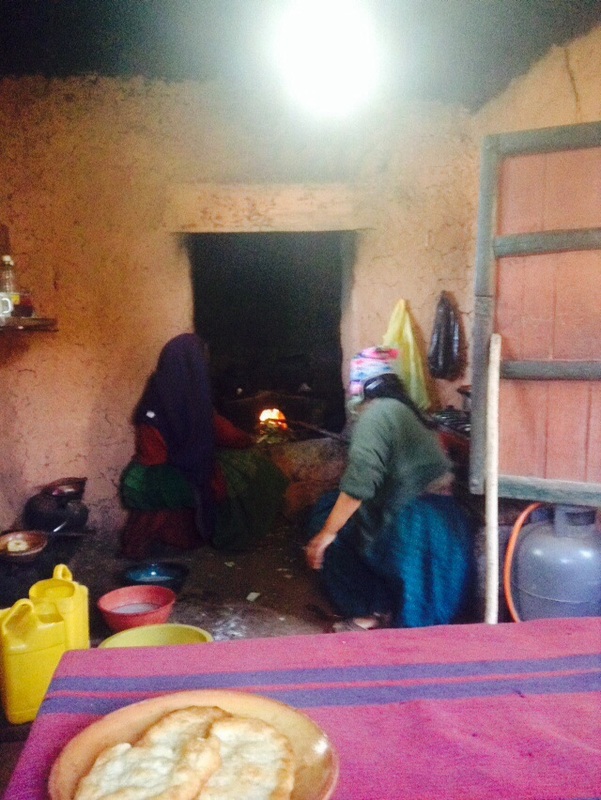 There is only electricity in the kitchen and the bar area from 6pm – 10pm and then all the other areas we have to use candles or torches. There is only cold water from 5am – 10pm to wash in. It comes from the river and they have to purify it, then you can have a cold shower. The drinking water though is purified water and very clean. 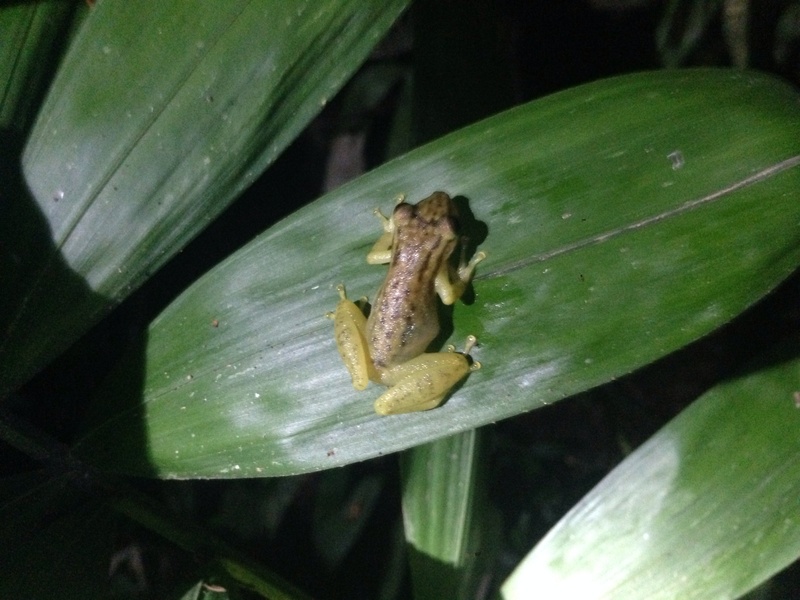 At 6pm our guide took us for a night walk in the rainforest and it was alive with insects, frogs and spiders. There were owls hooting in the distance and the biggest rat in the world was making it’s sounds – it’s called the bamboo rat. 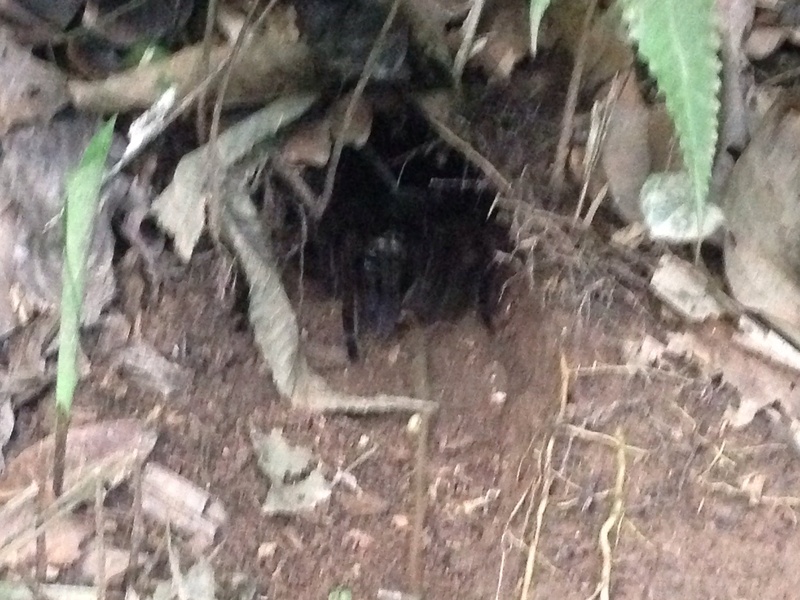 Our guide showed us a huge tarantula – he led it out of its nest with a small stick and it was really cool. We had to stay still because if we move it feels the movement and it is actually blind. It was very big – the biggest spider I’ve ever seen. And hairy! When we were getting here by boat we saw some red macaws and they were beautiful. I really want to see the blue and yellow winged macaw because I think they are so beautiful. I cannot wait to see some monkeys – they come out in the daytime and it’s guaranteed that you’ll see them if you go out in the jungle. There are little monkeys and large monkeys. I would also love to see some big tree frogs and some beautiful butterflies. On the boat we did get to see some green butterflies and the guide Joel said they were circling around the mud to get the sulphur out of it. It doesn’t make much sense to me. It would also be cool to see the big bamboo rat but it’s not so common in the day time. 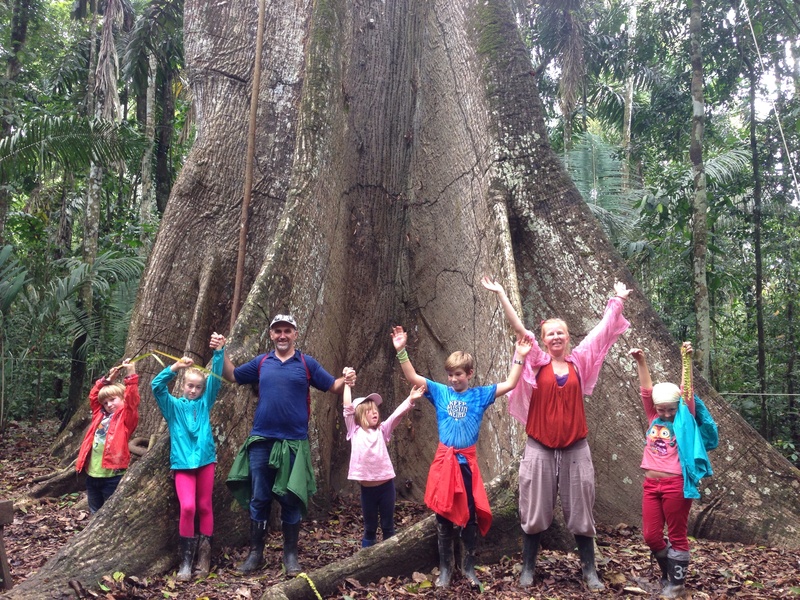 Today we had a very interesting day with our guide Paul – he took us around the Amazon Jungle. Of course not all of it because it is so so big. I bet if you came here for five years, six even – you couldn’t see all of it. Anyway, this morning he took us piranha fishing. To get to the lake we caught a boat down the Tambopata river and then walked for about 25 minutes to get to the piranha lake. When we were walking we saw some cappuccino monkeys and they like to go together with some other monkeys called squirrel monkeys. So that they look after them. The cappuccino monkeys are the size of a big book and the squirrel monkeys are smaller. We saw a bird that is like an owl called a potoo. It had a baby with it. We also saw some red macaws when we were close to the lake. They’re very beautiful. The boat we went on the lake with was two canoes attached together and then some wood over the canoes. It was pretty nice and called a catamaran. I didn’t catch a piranha but I caught a few sardines. Mum caught the only one because it was starting to get too late in the day and they get hot. Others caught some dog fish which Paul was very excited because he hadn’t seen that many of them. We were the first group of the year to catch dog fish. He didn’t let us touch them because they can bite off your fingers. The dog fish were grey with a yellow stripe in the middle of their bellies. They can last out of the water for 2 and a 1/2 minutes. When it was later in the day we went swimming – at first we were scared of the piranhas and Paul said there weren’t piranhas in the middle of the lake because they like to stay close to the shore. So we ended up all going swimming and I just couldn’t help myself – it was so hot and humid today that I couldn’t even take photos with my iPod cause it got disabled from the heat. The swimming was so cooling – I just jumped in with my clothes because we didn’t bring our bathers. I didn’t exactly jump in – Toby pushed me in! The water was really warm on the surface but cooler about 1/2 a metre down. The lake was much cleaner than the big river which is completely brown. 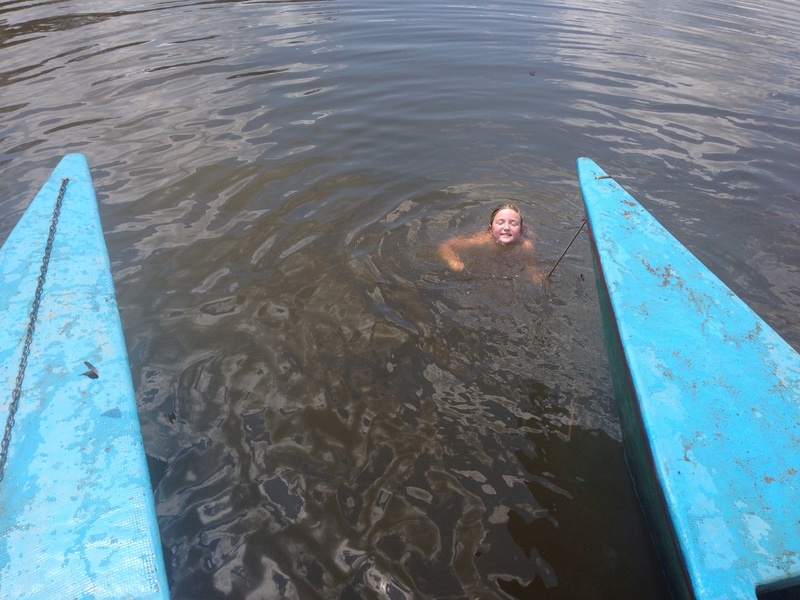 If you put your hand in the Tambopata river about three inches you can’t even see your hand. We were back at the lodge by 1.30pm and that’s lunch time. We had a nice lunch of rice, chicken, Peruvian baked beans and salad. Then we had about two hours to rest because it was the hottest part of the day. I went to our room and read my book and rested. At 3.45pm Paul took us out again but this time not on the rivers but into the jungle. He showed us how in the olden days the indigenous people hunted birds. They got a piece of hollow bamboo and got some big thorns from bushes and put venom on the end of the thorn. Then they waited for the birds to come closer and they blowed the thorn through the hollow piece of bamboo which went flying through the air and hit the bird. He put a leaf against some trees and we all had a go at trying to hit the leaf with our thorn, but ours didn’t have any venom of course. He also showed us some fruit trees. There’s a fruit called a star fruit. It’s almost like a mango shape but it has some wedges which made it look like a star shape. Paul cut it up with his big knife and he gave us some to try. I didn’t really like it because it was a bit bitter but I ate it. When they make it into juice at the lodge I like it a lot better. 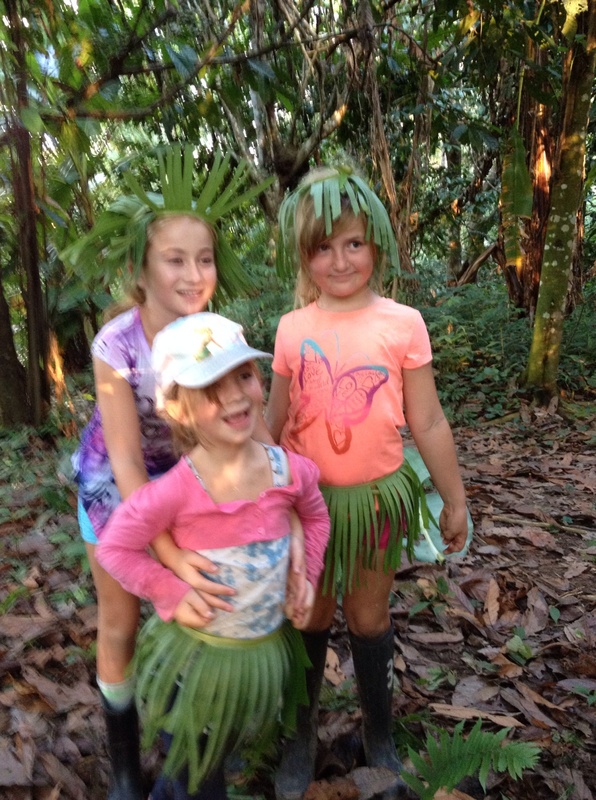 Paul made some indigenous clothes out of big leaves. It was really cool. He made a crown and a skirt but they didn’t really wear any tops but of course we were wearing tops. 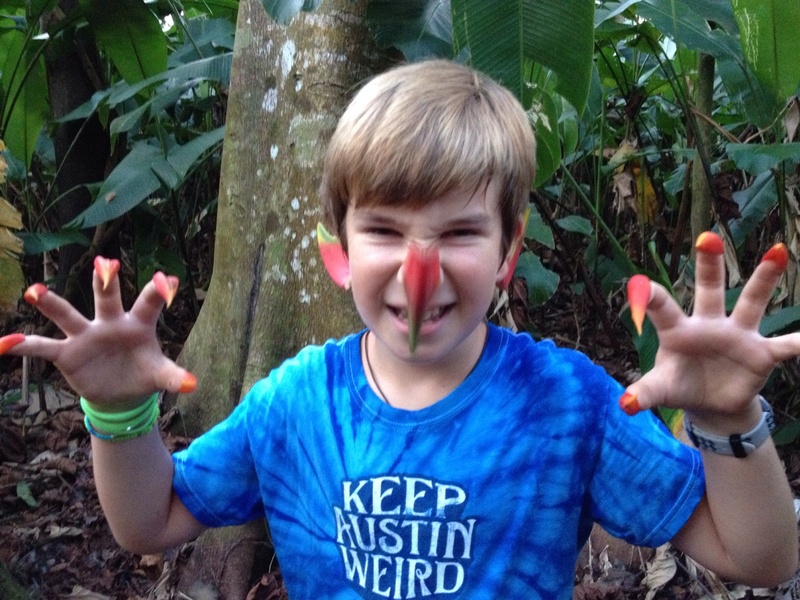 We walked further down the trail and he made some claws that looked like witch claws made out of flowers. He was so amazing. We were in the jungle for about 2 hours then the sun was going down so we went back to the lodge. Now we are waiting for our dinner by candlelight cause there’s not much electricity. The food has been very traditional but very nice. See ya later. Today was an absolutely awesome day. 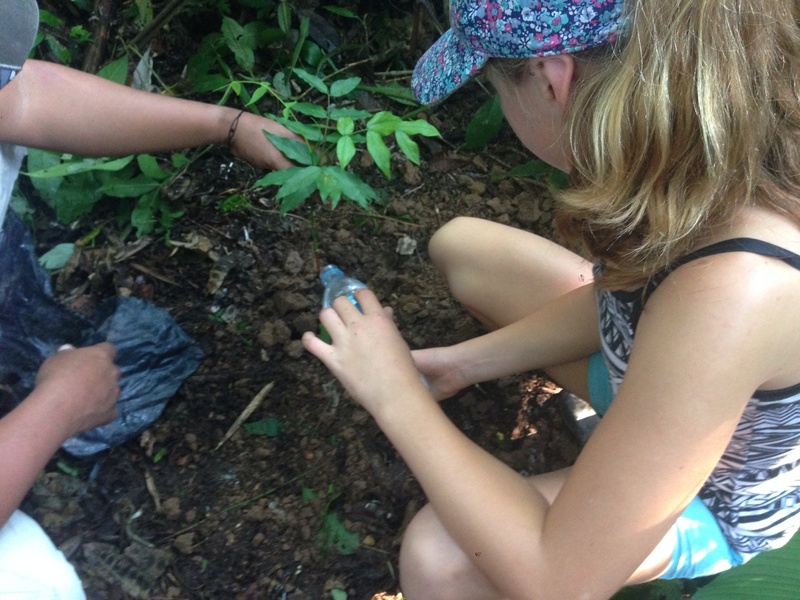 We went back into the amazon jungle and our guide Paul made us some jungle whistles out of hollow pieces of bamboo. They made a high pitched sound and the longer ones make a recorder type of sound. We also went to a swamp we were going to look for animal footprints but it had been raining which made the footprints disappear. Instead some of us made wax prints of our hands. First we had to put our hands deep in the clay and mud and then pour hot wax into the shape. Paul was very well organised. While we were waiting for the wax to dry we went to a massive massive tree with a tree house at the top. We tried to climb on the vines but they were wet so we got up as high as we could and it was still lots of fun. He also taught us how to weave grass and we made bracelets. He knows lots about the jungle. He can answer every question we ask him within 2 seconds. For example we asked him what kind of bird makes that sound and he knows the answers within a second or two. There are sounds all the time in the jungle. It takes a while for you to get used to them. For lunch we had lots of yummy food but one thing that was strange and interesting was bush potatoes. They were almost between a potato and a banana. Just before we were going for our afternoon walk we saw some squirrel monkeys and cappuccino monkeys. The squirrel monkeys are so small and adorable. The cappuccino monkeys are a bit bigger. They were looking for bananas. In the afternoon we planted three trees that are rare and good for the environment. 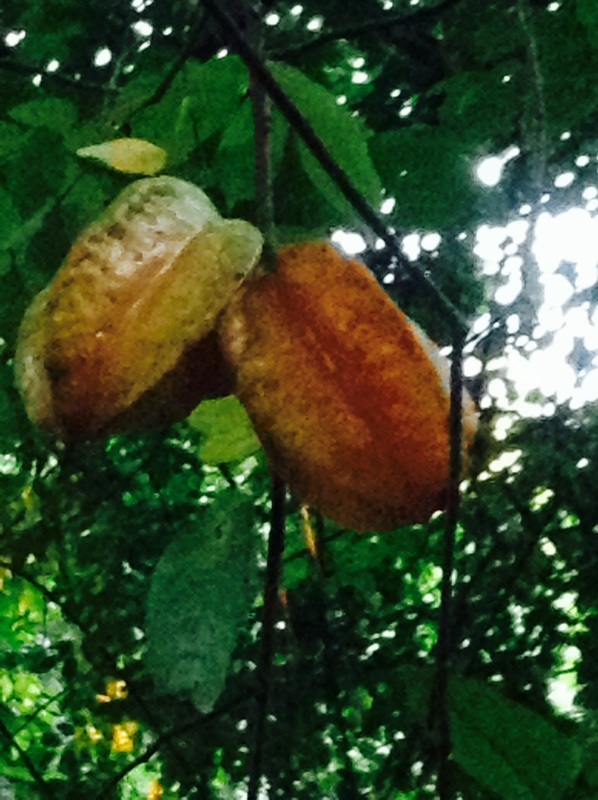 The tree is called an Aidon tree, and it’s getting more rare because farmers cut it down to make charcoal. Something else that was really interesting is a leaf that he showed us that people used to use for dying. You put the leaf in your hands with a drop of water and rubbed into your palm. The colour that comes out is a dark purple. Paul used it to do face painting on us. At the end of our afternoon we went to the beach at the river and it was all muddy. The banks were very muddy and we got soooooo dirty and made mud balls and threw them at each other. There were lots of water hog prints in the mud so we stayed away from them and made some wax prints of them. Kalika got on her hands and knees and started crawling and she called her prints the ‘Kneeosaurus’ prints. Emilio was the muddiest hands down. Toby slipped as soon as we got to the muddy banks and he thought it was my fault and started chasing me but I got away. Zoi started out with purple shorts that turned into brown shorts. At the end Kalika says ‘Yasmina, I’ve never known you to get your clothes so dirty’. Until she said that I didn’t realise that my clothes were so dirty. So I had some fun washing my clothes in the cold shower. However it is so hard to dry anything in this humidity. The walk back to the lodge always feels much shorter. It was good to get clean again. Paul took us to the jungle and he made an amazing skirt for me. He also made us some finger nails out of some flowers – it was so cool. He also made a nose and some ears. 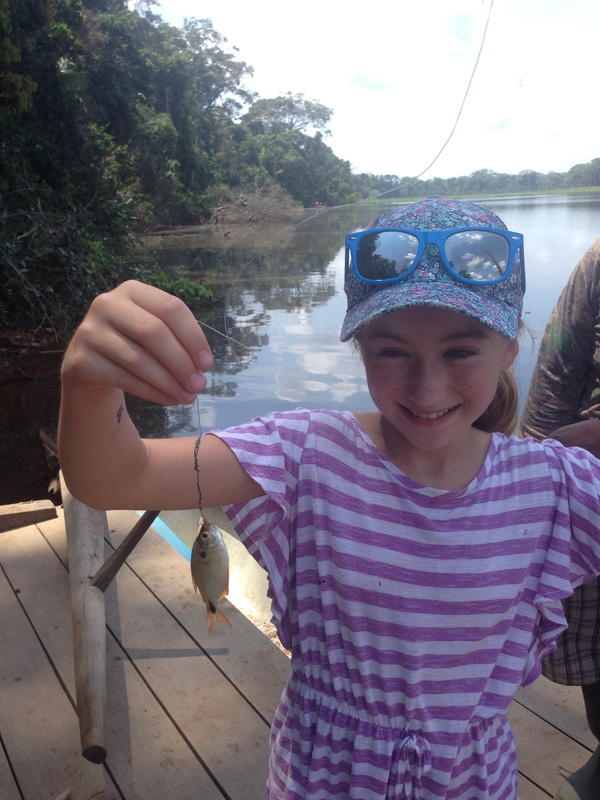 We saw some monkeys in the morning and we went on a boat and I went fishing and caught a piraña together with my mum. It had small teeth but very sharp and they can bite off your skin. I also caught some butterflies and had lots of them on my skirt and my hands. I liked the king jungle hat that Paul made for Toby. Walking in the jungle was so exciting and seeing the monkeys. At the lodge they have some biscuits and I love them. Paul let the piranha eat some of Yasi’s biscuit to show how sharp their teeth are. We went swimming in the lake and had a very very nice day because we saw lots of exciting stuff. I really loved the skirt Paul made for me but seeing the jungle was my favourite thing. Today we woke up at 5.00am to go bird watching with Paul. We went on a short boat ride to the other side of the river where there was a bird watching hut set up. The best time to see birds is at sunrise in this area. 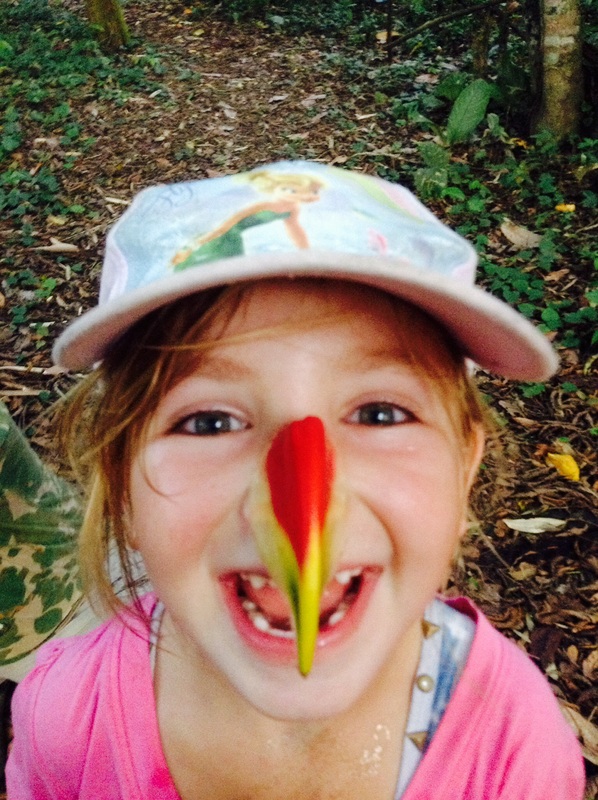 We saw green parrots, blue winged macaws and parakeets. They were eating the clay to get the salt, vitamins and nutrients they need. The place they go to is called a ‘Clay lick’. Most of these birds are endangered because of their predators and poachers which means that people catch them to sell to people who want to keep birds in cages. Another reason is because each bird normally has one baby per year so it takes a long time to get the numbers up by breeding. When we got back to the lodge we only had a little bit of time to pack and then have breakfast and a short relax on the hammocks before we had to get back on the boat for the 1.5 hour trip to where the minivan picked us up to take us back to Puerto Maldonado. 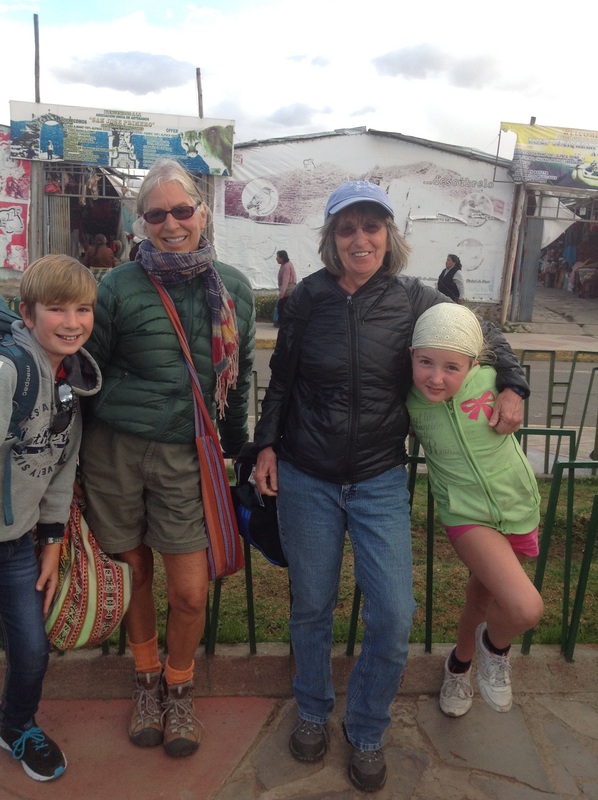 We had quite a few hours to wait in Puerto Maldonado before our overnight bus to Cusco. Therefore, we got to go to the local market which was very cheap so I got some new runners – my old ones were small because I had been wearing them for a year. I also got new thongs cause my old ones were falling apart. I even bought some gel for my hear – I was so pleased with my purchases – I think everything was very cheap. 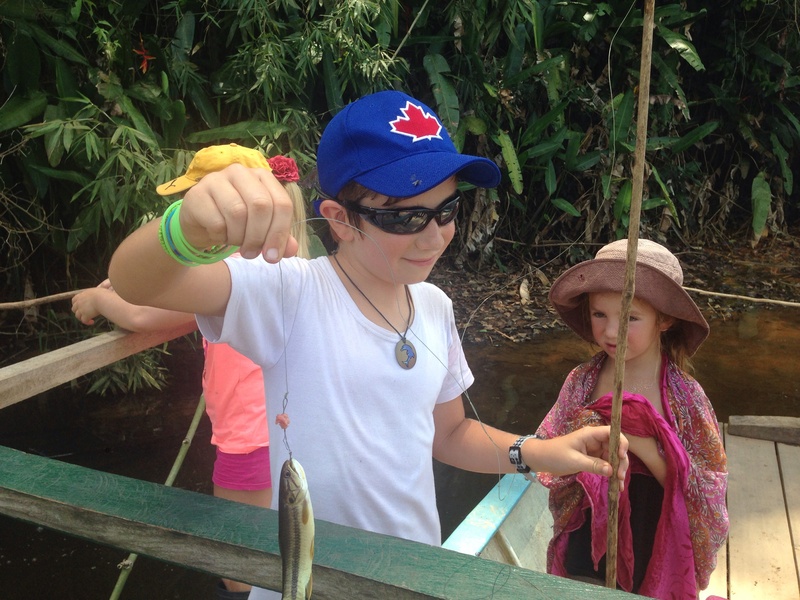 Our Amazon jungle trip was really interesting because we got to see and learn so many different things. The nature there was wonderful. I would really like to go again one day. 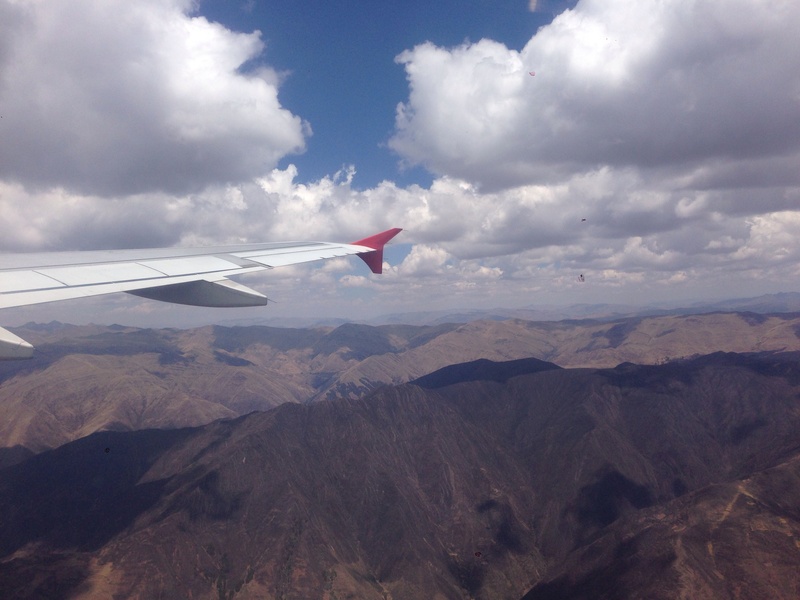 Enroute to Lima and the start of our Peruvian adventures……. On the way to Lima we stopped by Houston to visit our friends – Cathy C and Kathy K. We call them that because they’re both named Cathy but different spellings. They are going to look after our car for 3 weeks and even drove us to the airport. They have three very cute cats and two dogs, one is very playful and loves people. However the bigger one for some reason is afraid and every time we go close to him he backs away. They have a pool and we played happily there for ages because it was so so hot. There were fun mats and a dive board. We had an extremely good Pizza for dinner and they let us stay up late watching a movie. It was about how Mary Poppins was made into a movie. When we get back to Houston we are probably going to watch at least five Harry Potter movies because Cathy C and Kathy K are very big fans of Harry Potter. I bet by the time we leave Houston we will be big fans as well. We haven’t read them so far or watched them because we heard they sounded scary. Kathy K said that at least the first two aren’t scary but maybe after the first two they get a little bit more scary. I’m actually looking forward to them now. We had a short flight to Miami first and then we got on our way to Lima. Miami to Lima was an amazing flight because there was entertainment screens and we even had our own remotes and even had games. Three of the games that I loved was battleships, chess and golf. We haven’t been on many planes that have movies and stuff like that. We got to Lima at 10.30pm. Harry Hildebrand who’s parents are our neighbours in the King Valley (and grandma went to school with his mum) picked us up. We weren’t expecting to see him so it was an amazing surprise and always good to see a familiar face. He took us to our Servas hosts where we were staying. We arrived after 11.30pm so we were all dropping off like flies. There were five people in the family all living there and it was a 4 bedroom medium sized two storey house. Most of us kids slept on mattresses or couches in the living room and mum and baba got to share a single bed but at least it was a bed. The family were lovely. There was the mother Margarita and her adult daughters Jessica and Melissa. 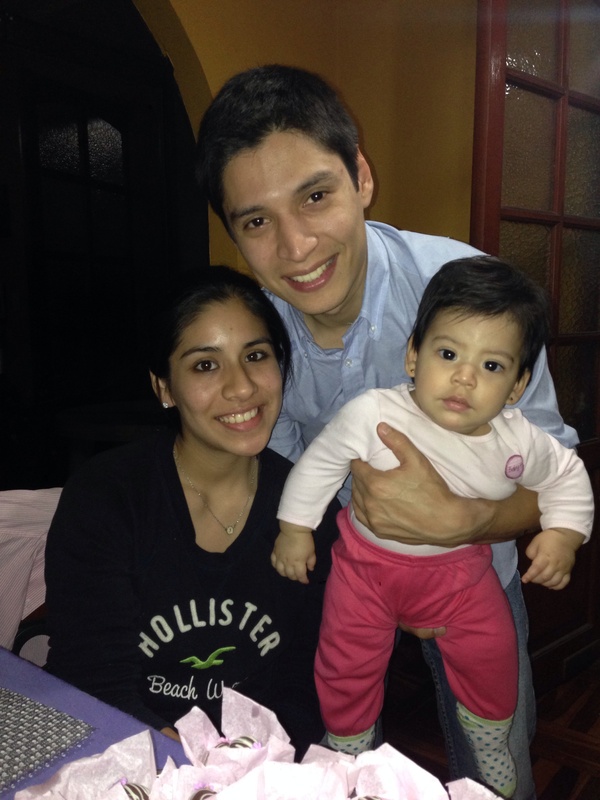 Jessica was married to Dik and they had a 6 month old daughter called Alyssa. Her christening was the day we left so we helped them makes some chocolates and stuff for the party. In Lima I loved the park at the zoo most of all and playing with my Lego. 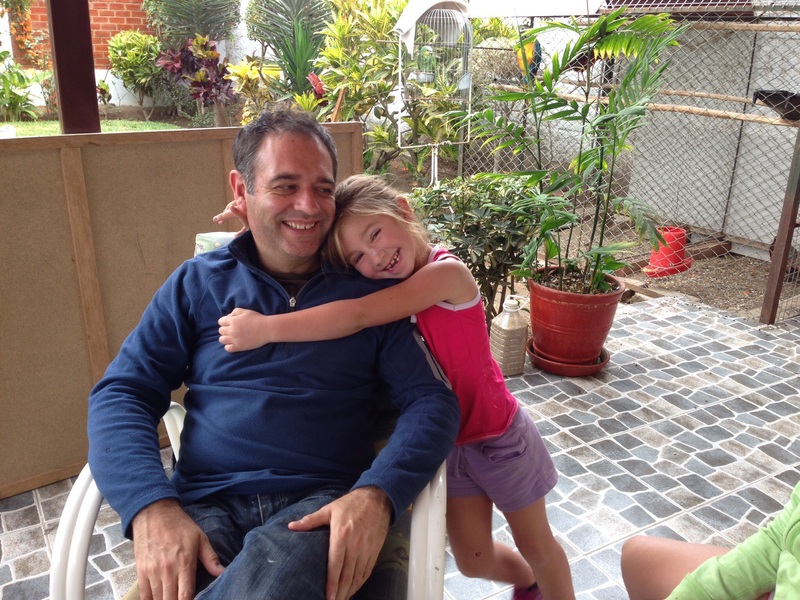 I was so touched by staying with Margarita and her wonderful family. 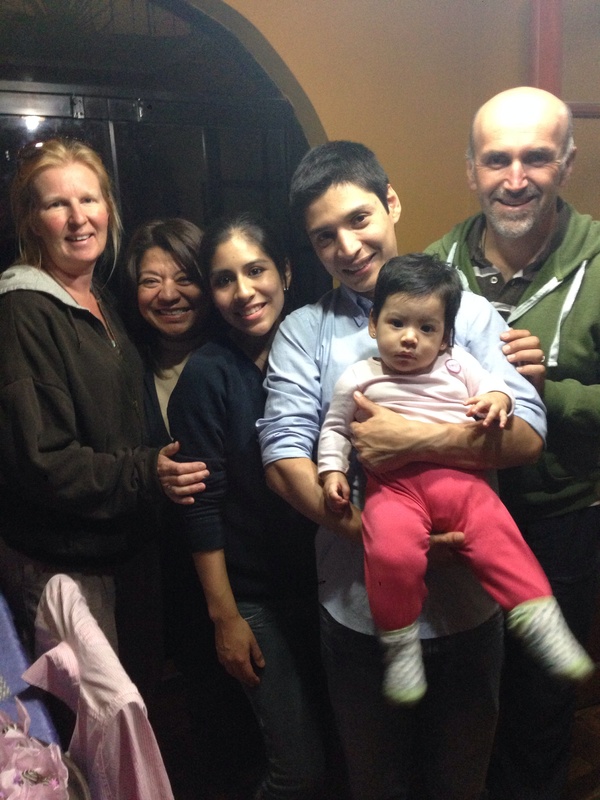 It was awesome to fly in to Lima and go straight to a wonderful Peruvian family. They were so welcoming and friendly. We arrived late in the evening and pretty much went straight to bed but we connected well straight away. I love SERVAS for these great opportunities which are a great and cheap way to travel but most importantly SERVAS is a group to promote worldwide peace, friendship and understanding between all people. The next day our good friend from Australia – Harry came over with his son Luca to take us out for the afternoon. We had our introduction to one of the most delicious foods ever – ceviche – an amazing raw-ish fish dish that is actually cooked or poached in lemon juice and other spices. OMG – my mouth is watering and I have a new favourite food. 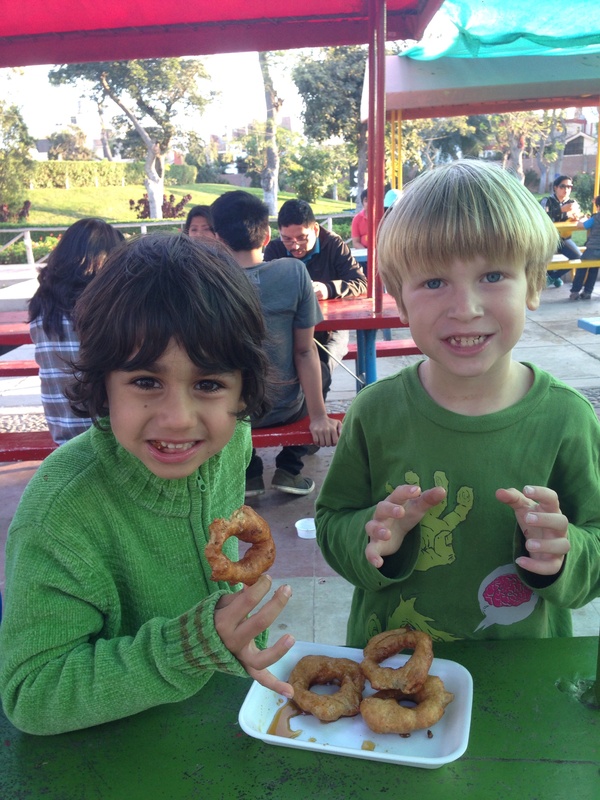 Then we ventured down to the Lima zoo where the kids had a lovely run around together and we tried yet another Peruvian delicacy – picarones – a sweet potato donut cooked right in front of us – awesome. 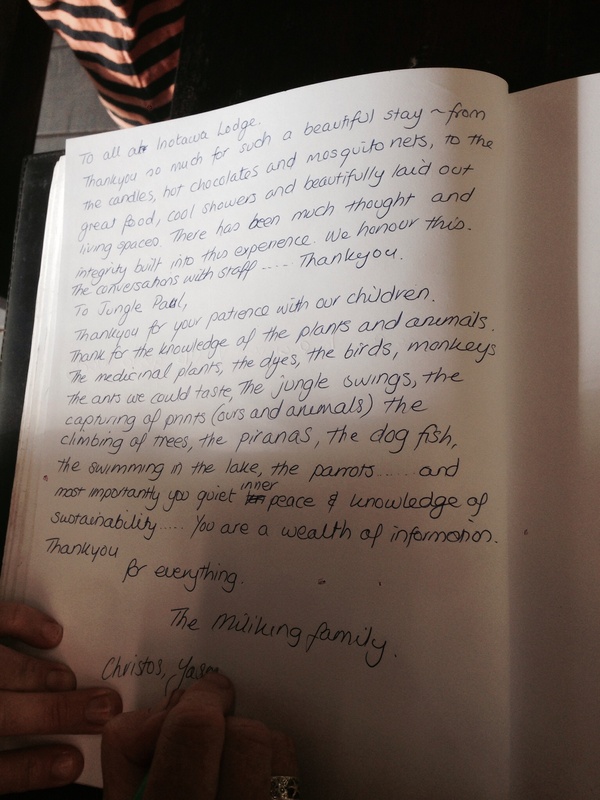 The next morning the long journey to the Amazon jungle began……. 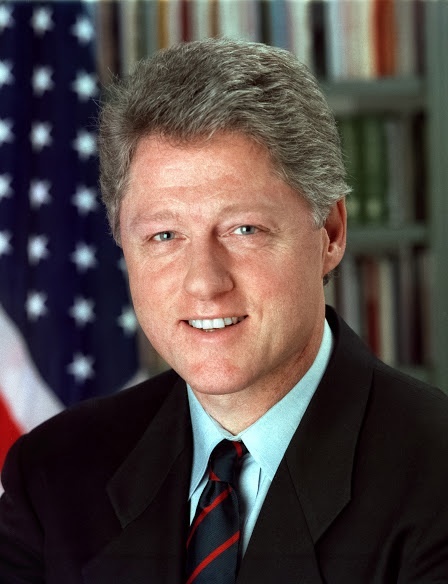 Bill Clinton was the president of the USA for 8 years back in 1992. Bill Clinton was a very good president and changed a lot of things. When he was the governor of Arkansas there was an argument between a school and black people and he set a rule so black people could go to that school with the whites. Bill Clinton also said to every one in America that the black Americans could work together with whites and it worked. He seemed like a good person and tried to do lots of good things and help black people live the lives they deserved. We visited his museum in Arkansas and watched a short video by him. 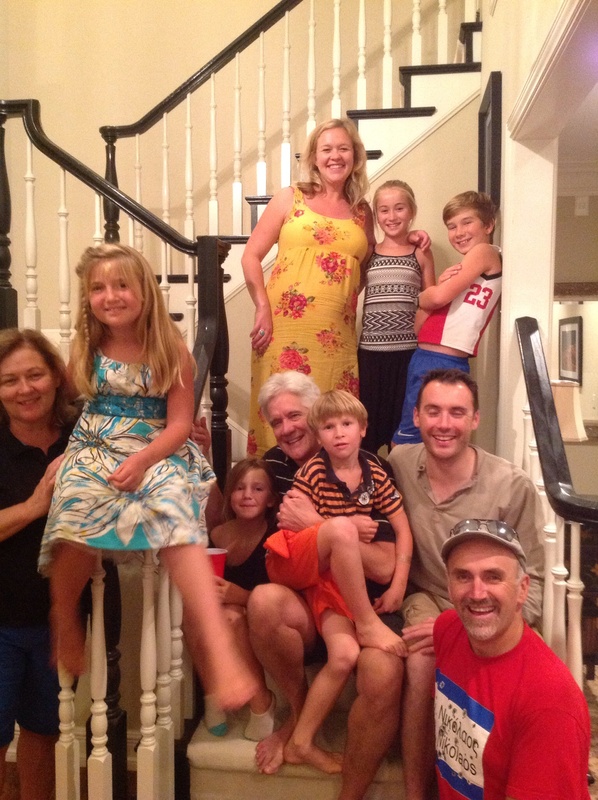 In Arkansas we stayed with our friends Oliver and Amy. 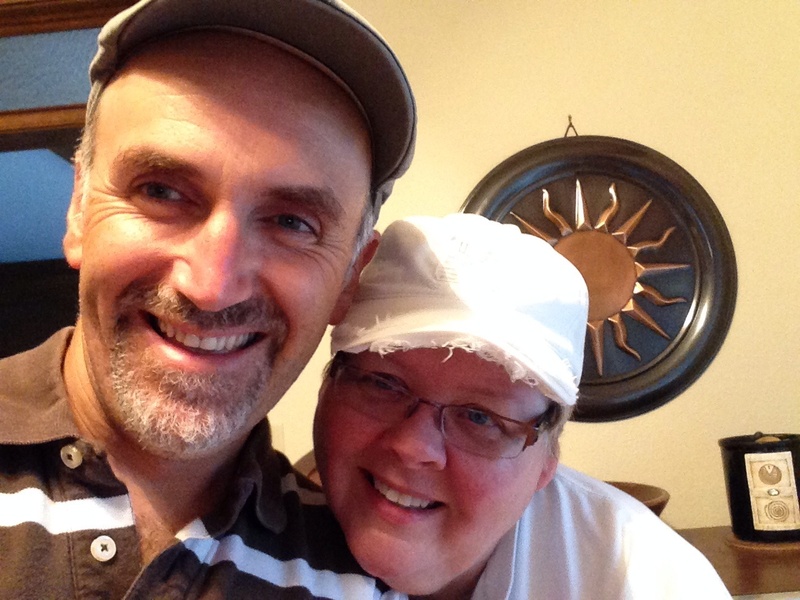 Amy is from Arkansas and Oliver is from England. They were visiting Amy’s parents Debbie and Steve so we joined them for a couple of days. We’ve seen Oliver and Amy now in England, Greece, America and Australia. Debbie and Steve have a humongous house and they have a cinema with a humongous screen. The outside yard is really big too but we didn’t go on the grass without shoes because there’s this type of bug on it that burns your feet. They also have a beaver that visits the lawn but we missed seeing it. We did hear coyotes at night though because their house backs onto a forest. We went into the town of Fayetteville and had lunch in a nice cafe then went to the park to play. We were going to have a picnic at the park but it was so so hot and humid. We also visited Bill and Hillary Clinton’s first marital house. There was her wedding dress there and there was a garden of all the favourite flowers of all the First Ladies ever since America was free from England. We played soccer at the park and the ball went in the creek but I went down to get it even thought the water was muddy. When Steve got home from work he put a movie on for us in his cinema room – we watched ‘How to train your dragon’. It was great movie cause the boy proved everyone wrong – I like movies like that. After we finished the movie we made pizzas on the BBQ. It was so cool – we were given a base that was a little bit cooked then we got to do our own toppings and then grilled it on the BBQ. It was a strange way to do it but was very very tasty. Next time we see Oliver and Amy they will have had a baby and will come to Australia to visit us. Bill Clinton is an amazing man and one of my favourite presidents I have heard of. I admire the things he did like to reduce poverty in American and to raise the economy. In his 8 years of being president he made 20 million new jobs. I learnt all this from visiting the Bill Clinton library in Little Rock, Arkansas. There was A video that they played for us about his life and how he changed the face of America. His dad died three months before he was born and his mother went off to New Orleans to study being a nurse so that Bill Clinton was healthier and had a good life. When he was about 10 he was very inspired by Martin Luther King Jnr and his speech ‘I have a dream’. Apparently Bill Clinton said that remains his favourite speech of all kind. 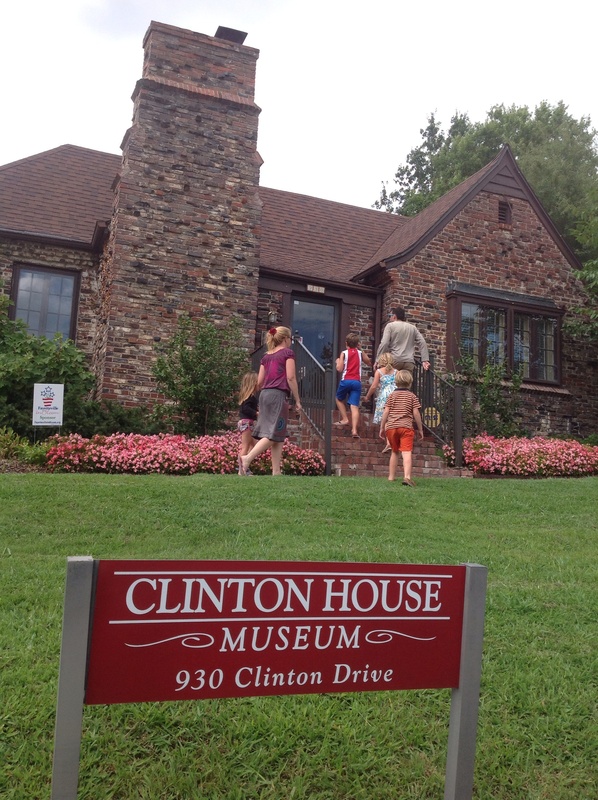 When we were in Fayetteville we visited his first marital house and it has been turned into a museum. 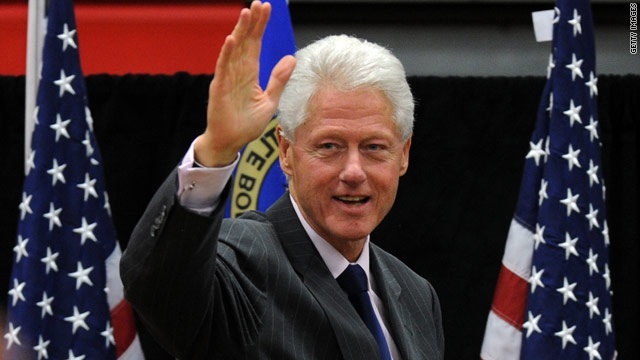 PS – I agree with Toby that Bill Clinton was a great president. Also I found it so interesting visiting his library with the kids because they were in awe watching the 20 minute video but obviously it was written from his and his supporters’ perspectives. It was obviously going to be positive. There wasn’t any mention of possible impeachment (didn’t know how I was going to explain that to the kids). Anyway it was a fabulous museum and great learning for the kids of the events that happened in his term. 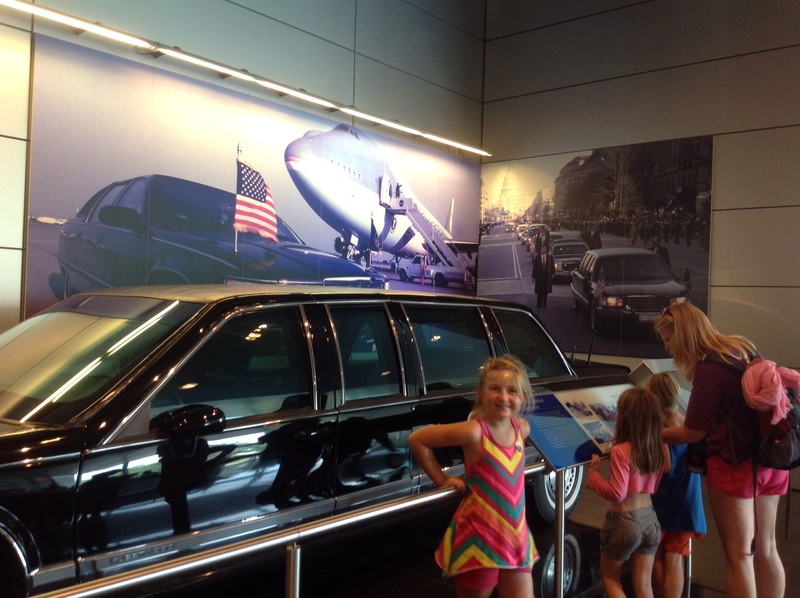 First presidential library that I had visited and it wetted my appetite to visit more of them. We almost stopped in at the George W Bush Museum in Dallas but it was $17 to get in and $11 for kids over 3 so far too expensive for us. Almost triple what the Bill Clinton library was. I was very interesting to hear George W’s speel on his term – he got in through disputed votes in the Supreme Court rather than a landslide like Bill Clinton and during his term the world changed in so many ways that I didn’t know how he would make a positive from it. Anyway – it’s an intriguing visit for another day. I think we will get to his dad’s library (museum) which is near Houston.